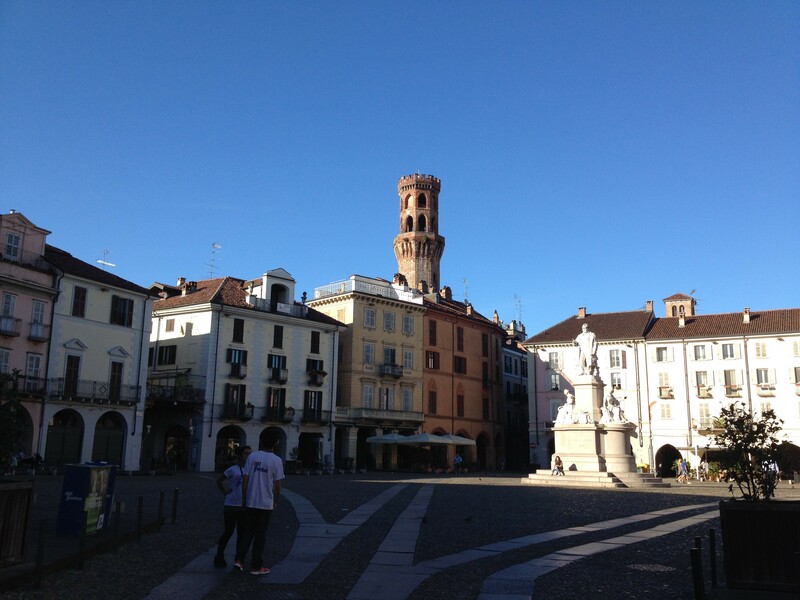 How can it be that one morning I am strolling through a piazza in Vercelli under a deep blue sky, and the next I am shopping in Tesco? That one evening I am listening to nightingales, and the next to “The Archers? 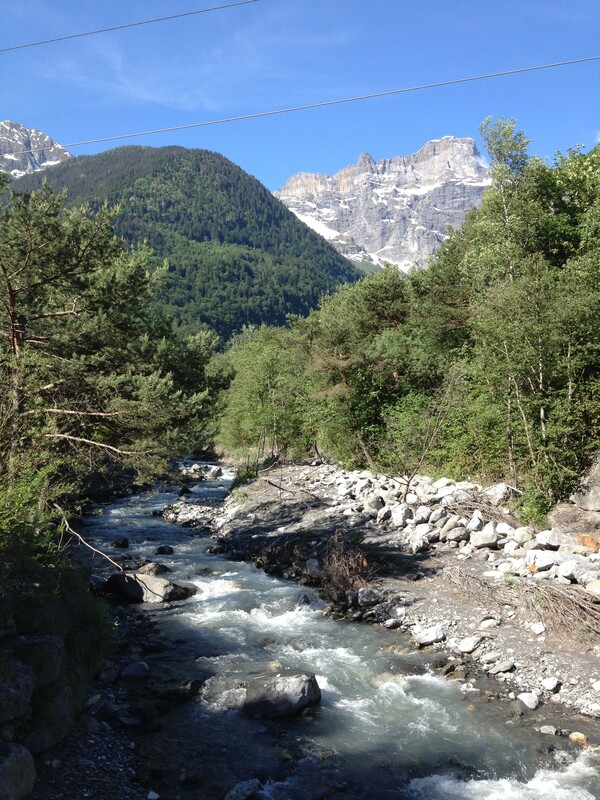 beside the Rhône as I walked toward St Maurice in Switzerland, and pondered with Job “Where shall wisdom be found? 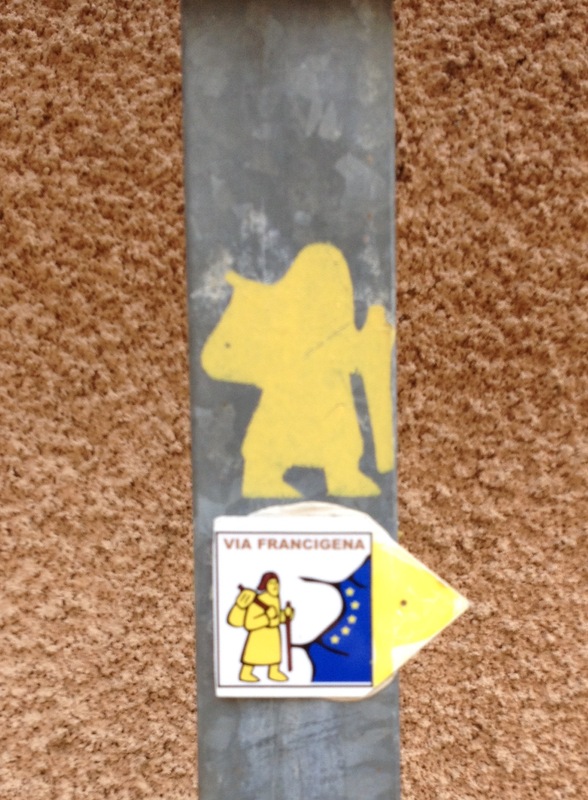 And where is the place of understanding?” Answer – maybe on the Via Francigena. I have certainly learned that I am not the person I took myself to be. And so there is a moment for a little reflection, but also a look back at some of the lighter moments…. 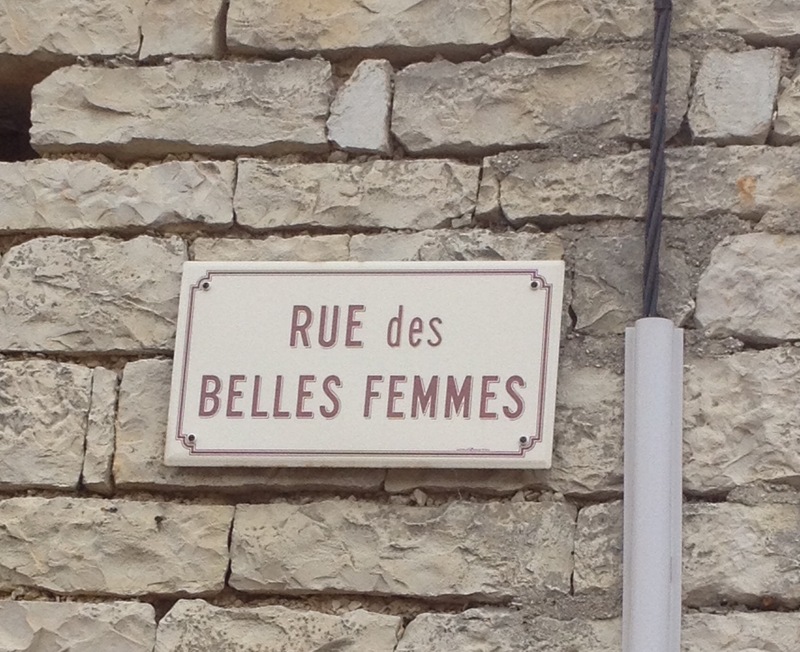 “Rue des Belles Femmes”, “Empty Bottle Alley”…. The road through France and Switzerland was solitary, and pilgrims rare. When pilgrims in these circumstances meet bonds are quickly forged, past secrets shared, future hopes revealed, and vulnerabilities become visible. Sometimes these friendships endure through the years to come; sometimes they dissolve into memories as pilgrim paths part, and one senses an erstwhile companion moving into the distance. Time now to honour those I have met so far. 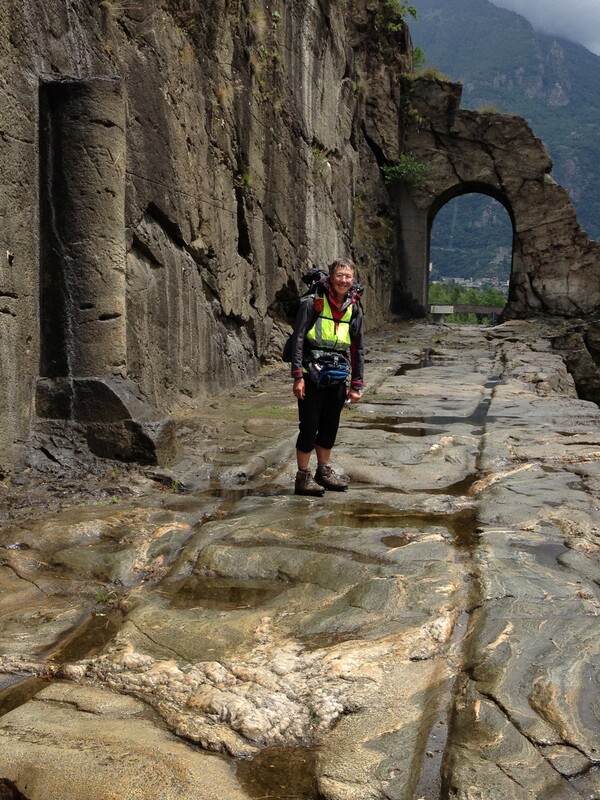 The first companion was Geoff Collier, a Welshman from Connecticut who set out from Canterbury the day after me, and who is now striding rapidly through Italy. 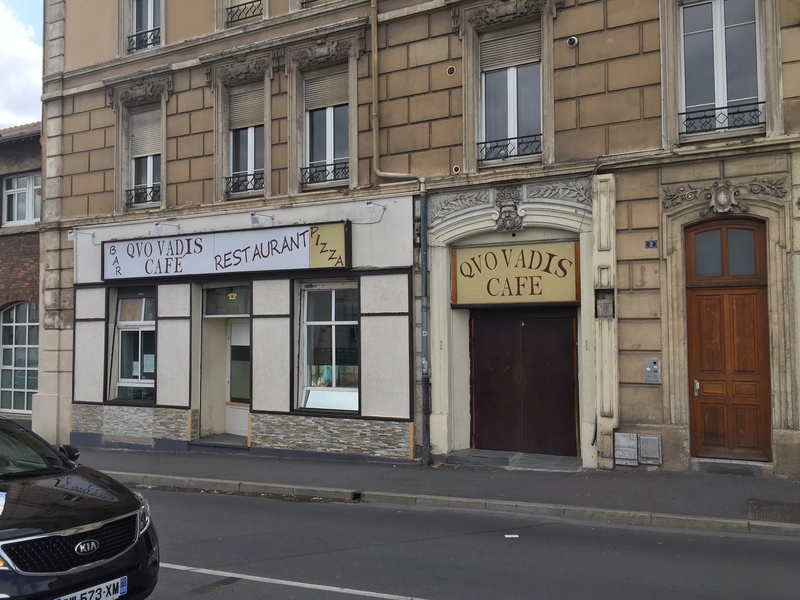 We shared meals in Laon, Reims, Champlitte, Besançon, and some memorable spaghetti in Gy; sparred, snarled and laughed, and parted near the Swiss border. He likes to call himself a Short Fat Welshman, but I think we must now substitute ‘Fit’ for ‘Fat’. His encouragement, his company, and his electronic contact when we were not together cheered many an evening. And still do. 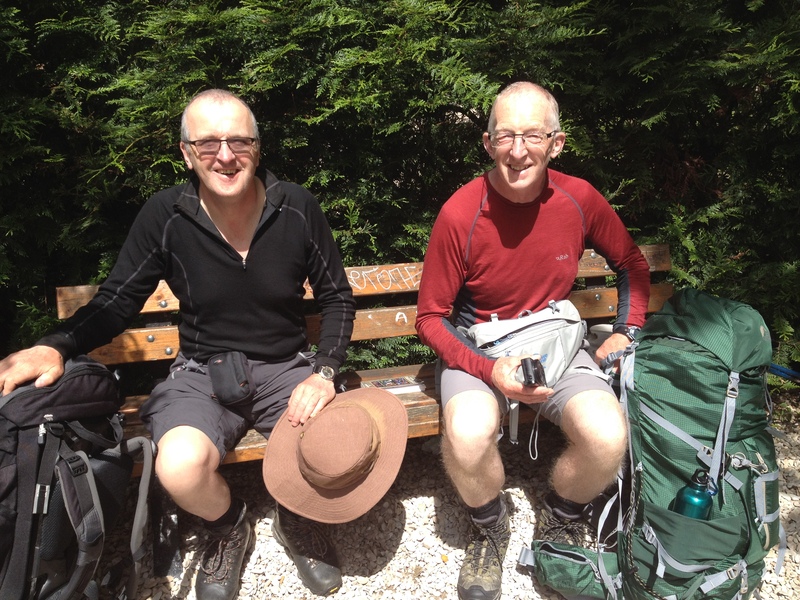 My next pilgrims were the Rev Tim Thorpe and Chris Taylor from Derbyshire , aiming to do the VF in 70 days. We met by chance in Châlons, where they recognised me from the pilgrim badge my daughter made. It made my day. 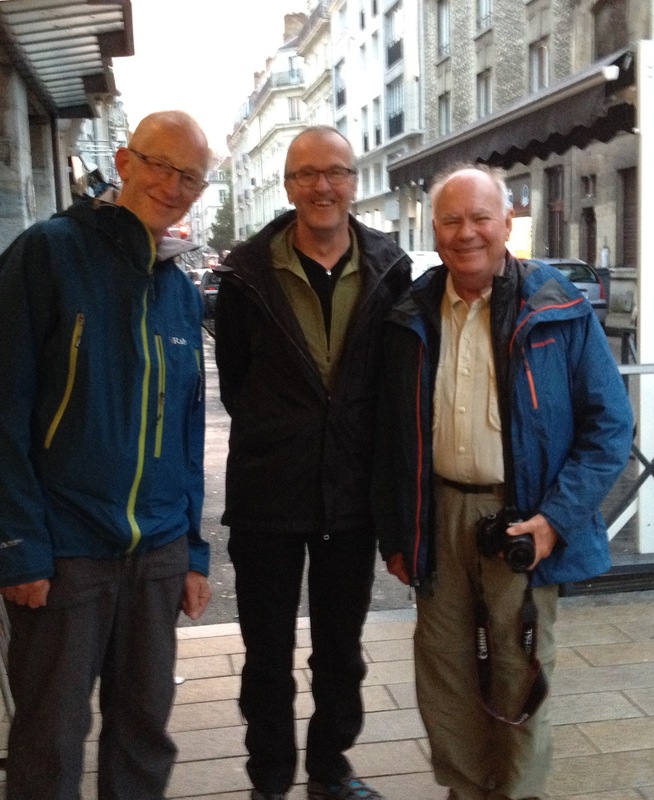 We met again in Besançon, and all ate with Geoff. 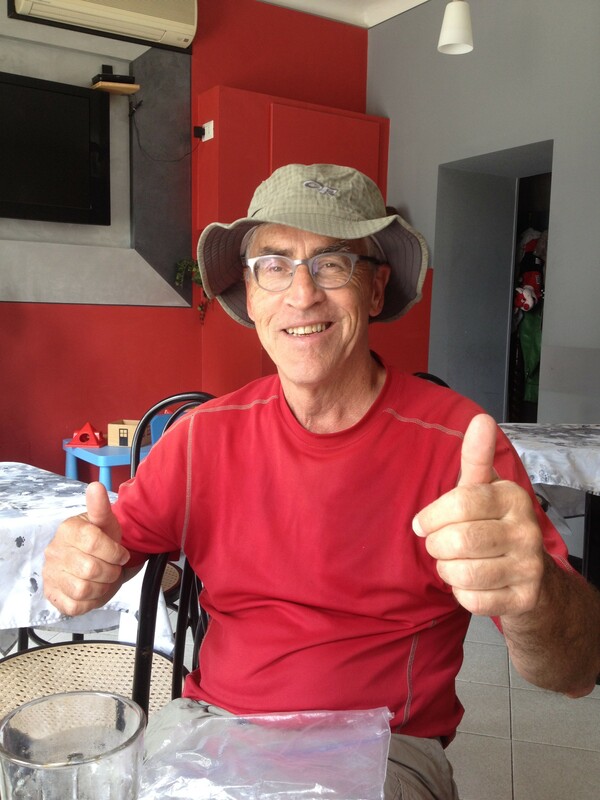 Those who have done any of the Caminos to Santiago will know the warmth and jollity, often le vin aidant, of a pilgrim evening. Chris is still in touch by email, and at the rate they are going they will be in Rome soon. Tim’s wife emailed me to say I’d got a mention in their church magazine. Such celebrity…! And then a long, difficult and solitary gap with no-one until I met Gilles the Québecois on the way up the Great St Bernard Pass. Without him I don’t think I’d have had the courage to go up through the snow. And we stayed together till Vercelli, where he was finishing. His Québecois accent rendered communication somewhat frustrating, but I might still be wandering round the Alps had he not showed me how to download the Lightfoot waypoints onto the Pocket Earth app. Then there were Swiss Sonia and Daniel, just doing a week of the Francigena to help Sonia over the recent death of her mother; Stephen a young Belgian carrying an enormous 16kg pack; and finally on the day before I returned home for my “pause”, Tim O’Brien from Sutton, who left Canterbury ten days after me. That should indicate my snail-like pace. When I return to Italy in the autumn I sense there will be more pilgrims; the way will be less solitary. And it will go on. Watch this space. A few days ago I realised that this account of my journey risked turning into a prolonged whine about the weather and my various ailments. Being British, I cannot promise not to mention the weather, specially since it has such a bearing on walking. The physical afflictions I will leave till the end, for they too play their part in this story. 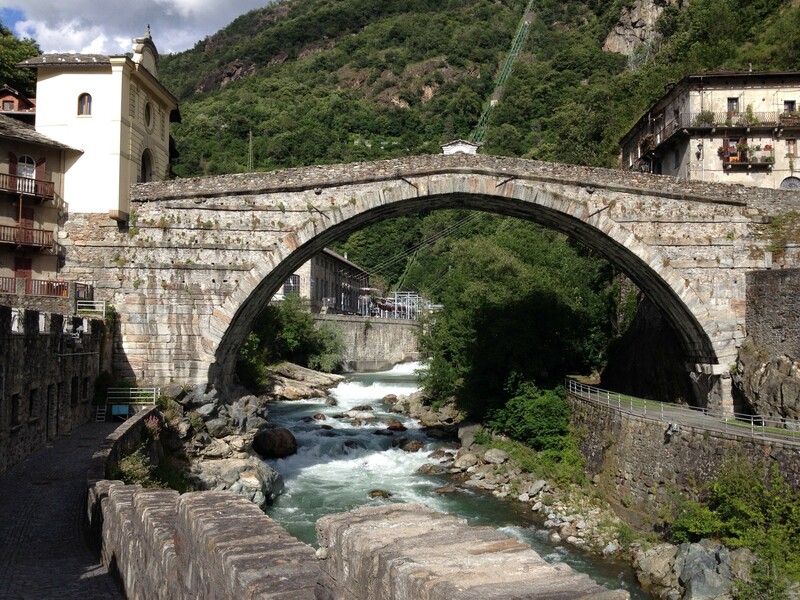 The Aosta valley is wonderful. It is lush, green, Alpine. It’s hard not to resort to the cliché of “towering peaks”, for they do tower, and magnificently. “Snow-capped” is another one to steer clear of ….but they are. The walk down from Etroubles to Aosta was in the main gentle and pleasant, but the lower I got the hotter it became: from 0 to 30C in little more than a day. 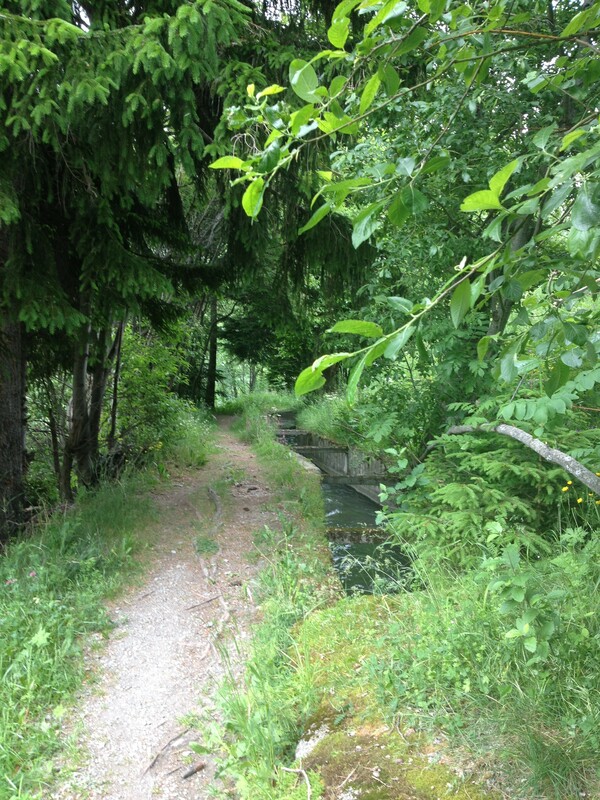 I noticed in Switzerland that I heard no nightingales. 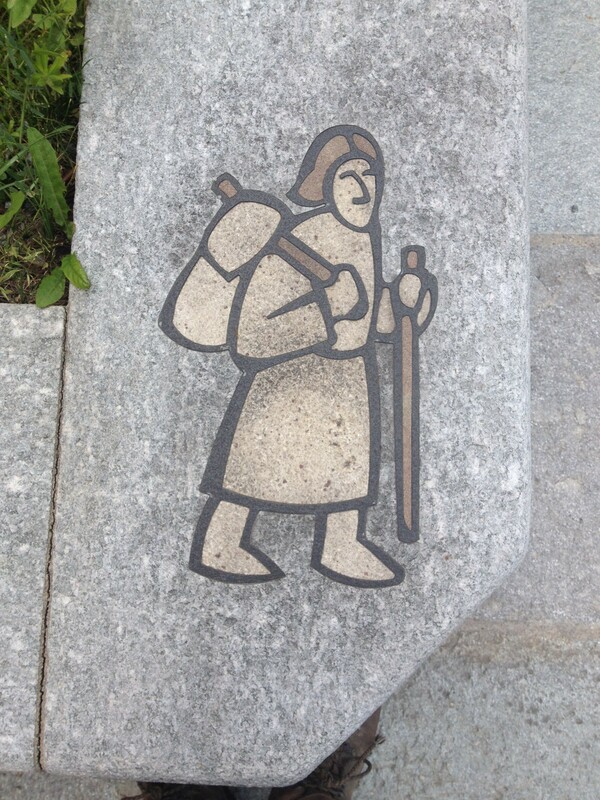 Perhaps they, like pilgrims on the Via Francigena, hurry to get out of Switzerland because it is so expensive. But in Italy they were in full voice: those swooning descending notes followed by a melodic warble, occasionally accompanied by the bassoon-like poop-poop-poop-poop of a hoopoe. 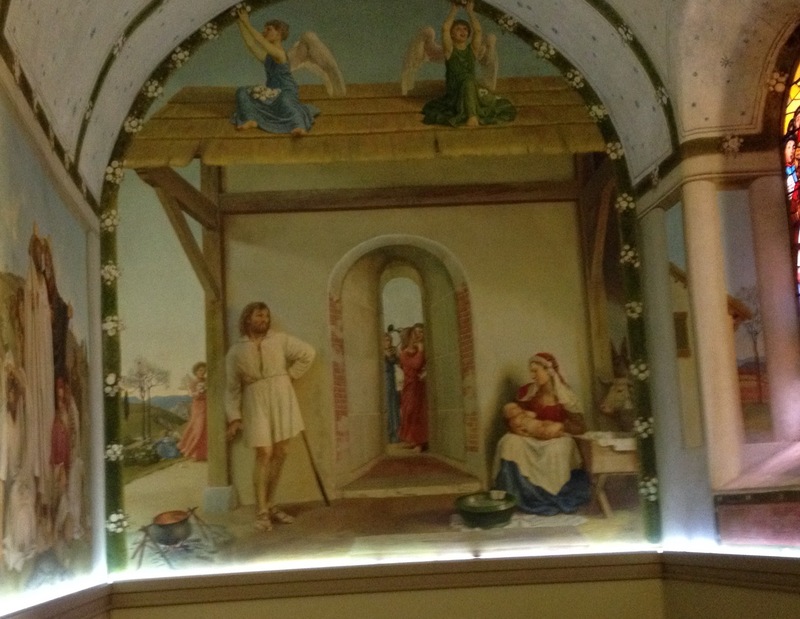 In Aosta (where St Anselm was born) I lodged in the parish centre of San Martin de Corléans. There was the most beautiful little apartment, with a bathroom which would not disgrace an expensive hotel, a kitchen area, and two beds. Everything done to the highest standard, and for a pilgrim donation. I asked if anyone were to share it with me, and was told they never make two strangers share. To anyone who has slept in the vast mixed dormitories on any of the Santiago caminos, this comes as a pleasant surprise. There was a second equivalent flat the other side of the landing. The next day was strenuous and hot: up and down, up and down, up and down, through little Alpine hillside villages, some long abandoned with the slate roofs falling through and the stones crumbling. 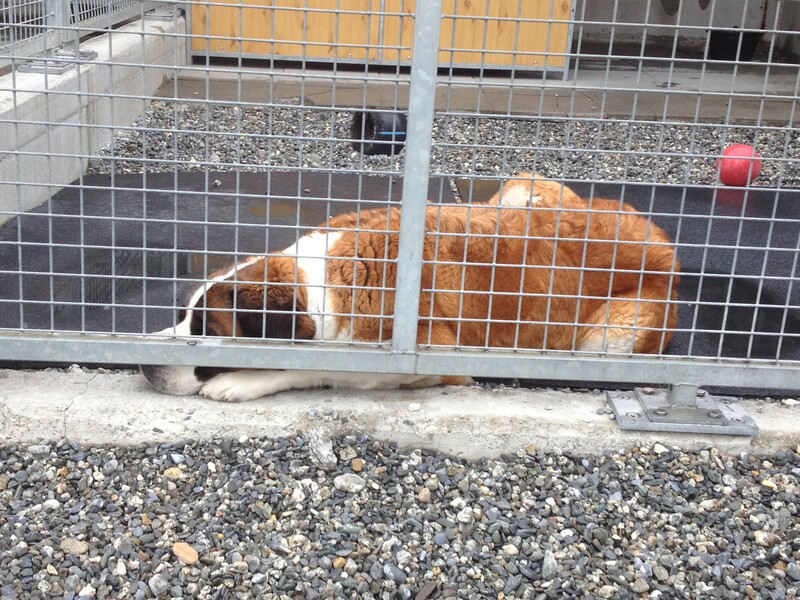 In inhabited villages there are many dogs, most – mercifully – behind fences. 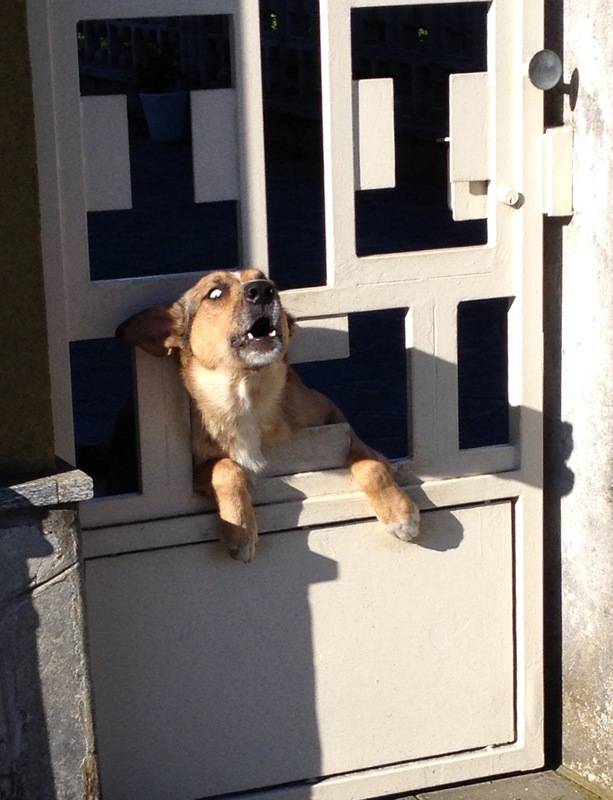 As one enters a village there is an abrupt shock as the first dog hurls itself at the gate in a paroxysm of barking. 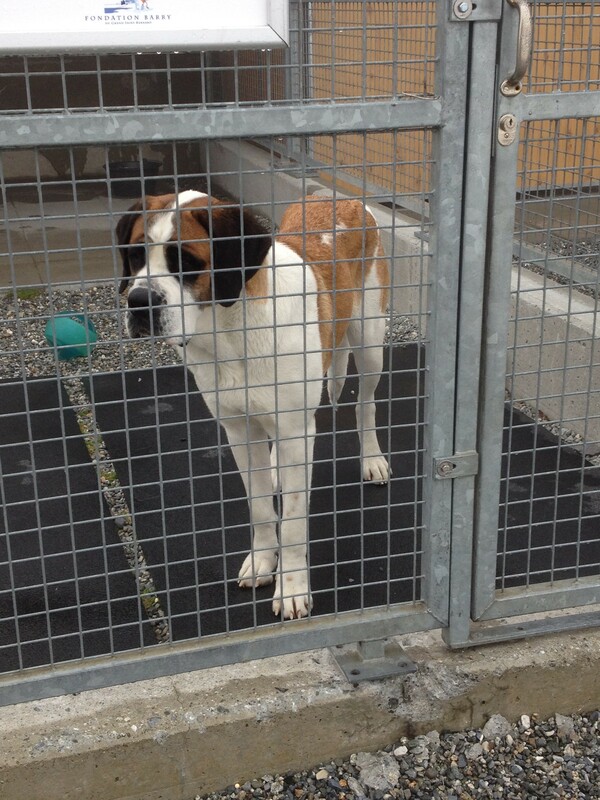 The dog in the next property takes its cue and joins in, jumping at gates and racing the length of the property. 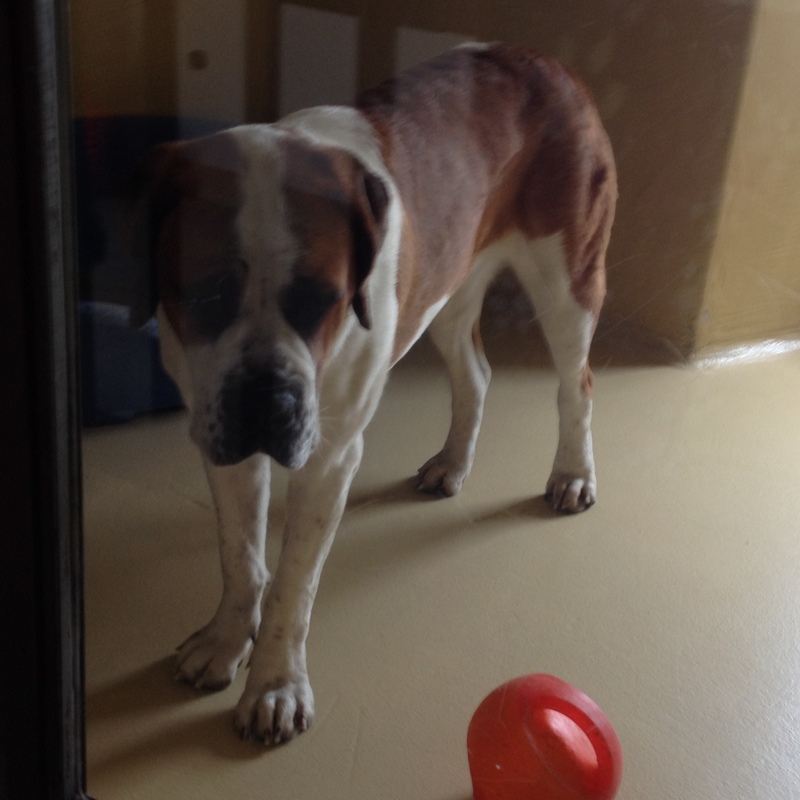 Then the next dog, and the next, down the line, in a mad crescendo until the entire canine population is at it. where the impressive Roman bridge was built in the reign of Augustus. How many millions of footsteps have made its stones ring? 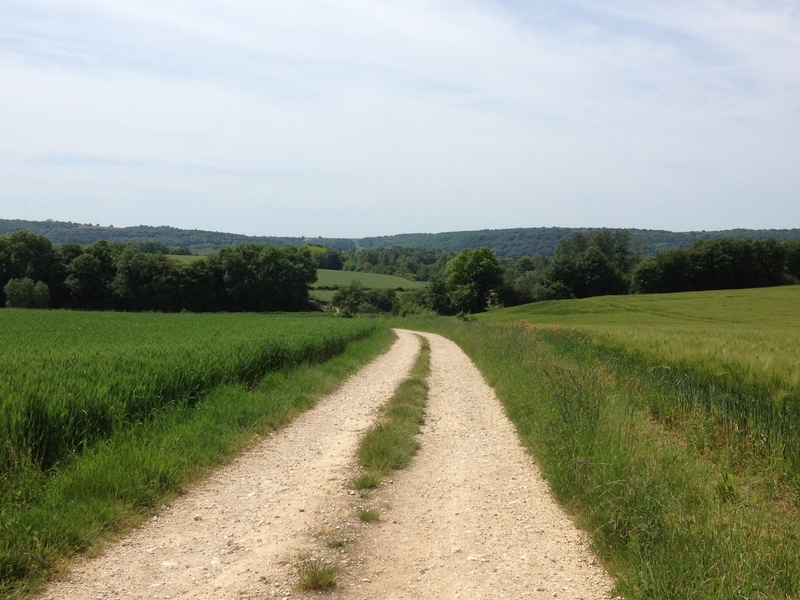 On the way into Pont St Martin I walked on Roman road, over the deep ridges made by cart and chariot wheels. 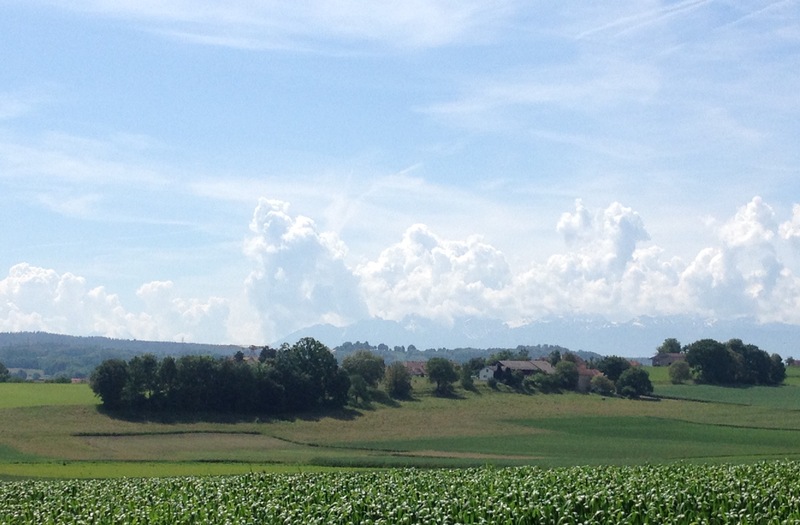 And from there the valley widens, the Alps are behind, and I entered Piedmont, where French is no longer spoken. 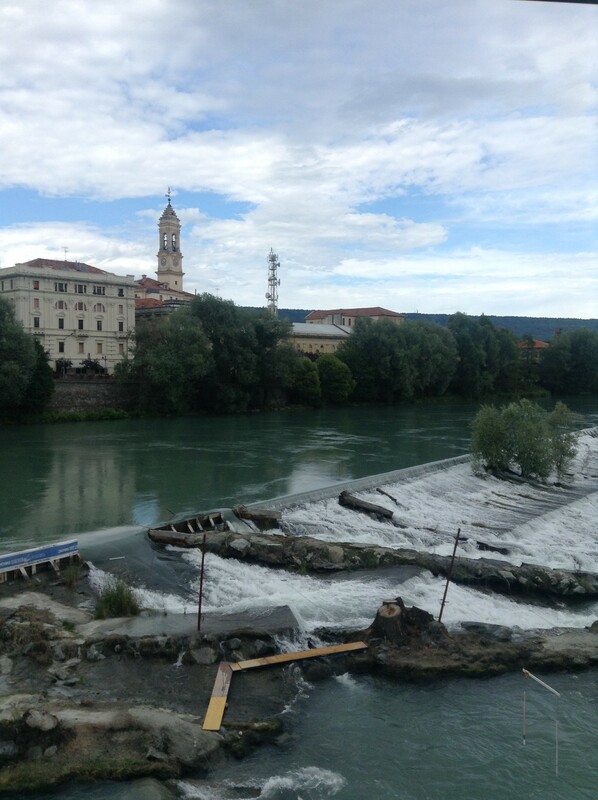 The next night was at Ivrea, where the pilgrim ostello is in a building on the river Dora Baltea, at a point where there is a great weir. At least the roar of water all night drowned out the sound of pilgrim snores. 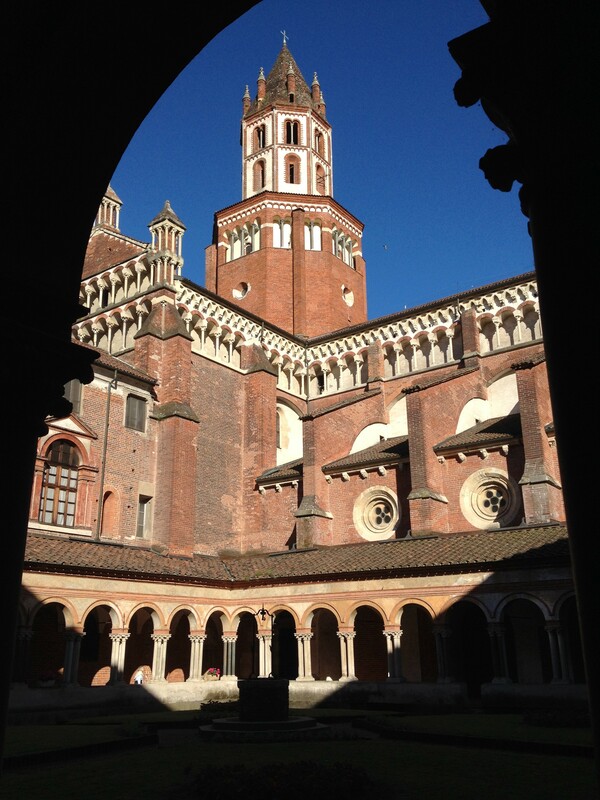 Flat ground now, and into the rice fields, for Vercelli is the rice capital of Europe. What lies ahead, if I continue, are days of shadeless paddy fields, infested by mosquitoes, and temperatures in the mid 30s. “If I continue”….for now tonight I must make a decision. For some days now the stomach pains which dogged my first week have returned, with sporadic nausea (this may just be the poor diet of nearly two months); my left foot is very swollen (memories of tendinitis in Spain); my knee is becoming increasingly painful. Add to that some rucksack problems (repair unlikely to hold), boots so worn down they affect my gait, and the increasingly ferocious midsummer heat (I simply cannot carry more water)….and you have my dilemma. The sensible option is to take a pause – go home, sort out foot, knee, stomach insofar as I can, and resume the 840+km to Rome when it is cooler in October. I could still be there before the end of the Year of Mercy. But do I ever do sensible? I find it hard to bear the shame and ignominy of not having completed what I set out to do (especially given all the trumpeting and publicity of granny marching to Rome). I know that those of you who have been so supportive will say it is no failure, but to me it is. So many have prayed for me that I feel I’d be letting you all down. And what of those guardian angels which have helped me on my way? What of the sermon I heard when immobilised in Châlons? “Il faut continuer sur le chemin que vous avez choisi “, said the priest. I must decide by the end of tonight. Does the way go on? And if it does, does it go on now or later? Only I can decide. A sign would be good. Once more, if WordPress plays tricks, please go to the main site: http://quovadis-walkingtorome.uk, where a correct version with photos will eventually be available. 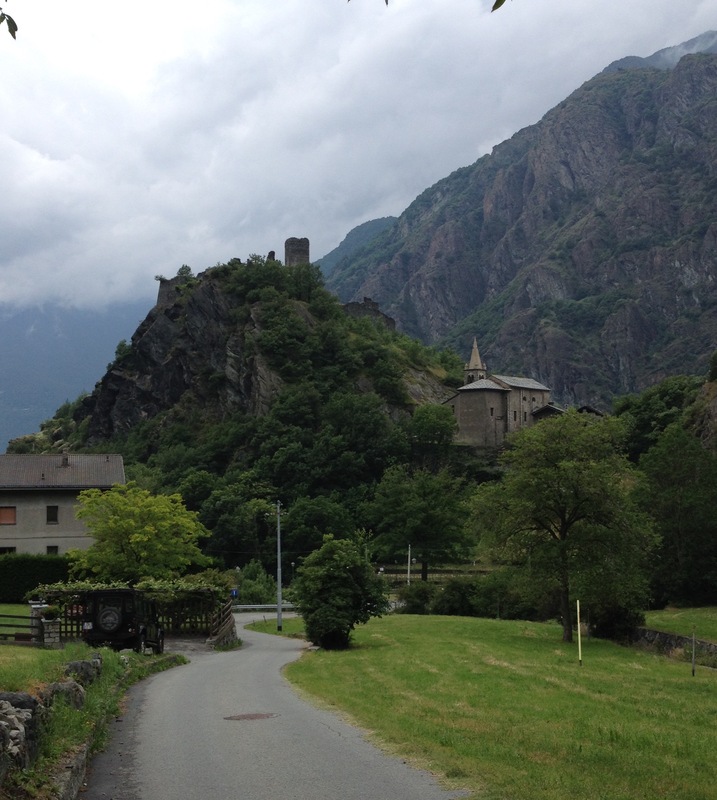 Etroubles in the Val d’Aosta, Italy, 13 June – I didn’t think I’d get this far. 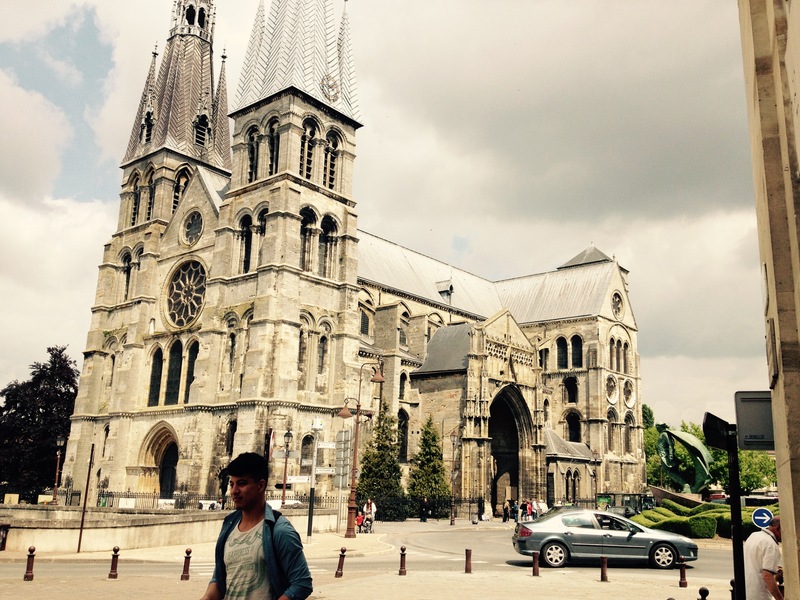 I left Lausanne on 8 June. When I visited the cathedral the previous afternoon I was astounded as I entered by the most glorious sound: a chamber orchestra and a soprano were rehearsing part of the Mozart Mass. As I came in they had arrived at the “Et incarnatus est”. Her young voice soared up and filled the building with such beauty I had to hide behind a pillar and fight my tears. Tears are never far away at the moment – possibly something to do with vulnerability. 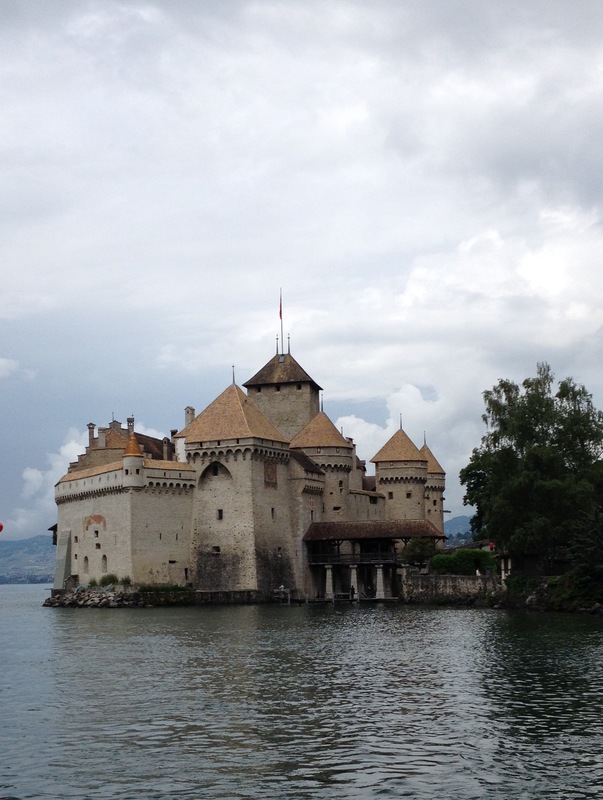 Emulating Archbishop Sigeric, I took a boat round the lake to the Château de Chillon (think Byron…”My hair is grey, but not with years/nor turned it white in a single night”), and then walked on the short distance to Villeneuve, where the rain obligingly held off till I was under cover. 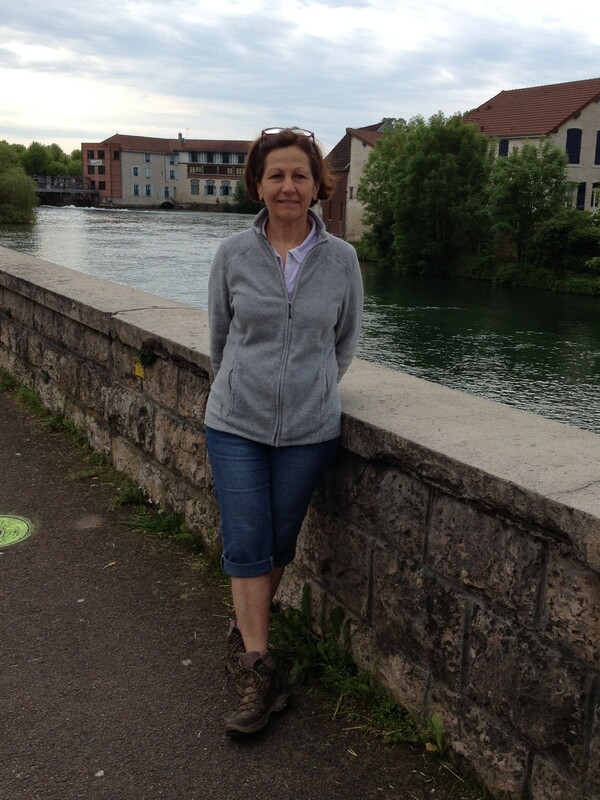 The next day was to be an easy and flat 25km walk up the Rhône valley to St Maurice, but idiot here had left the clip fastening of her water bladder in Lausanne. Thus I deviated into the town of Aigle to find a sports shop. By now the usual torrential downpour had started, relentless and drenching. I found the sports shop and bought a 3-litre bladder, mindful that Italy will be hot. CHF55! That will teach me to be more careful. Trying to get back to the path proved tricky, necessitating wading through waist-high soaking grass and scrambling through dense woods. Eventually I got there, having done quite a few supplementary km, and walked through the constant rain, the Rhône flowing full and fast by me. 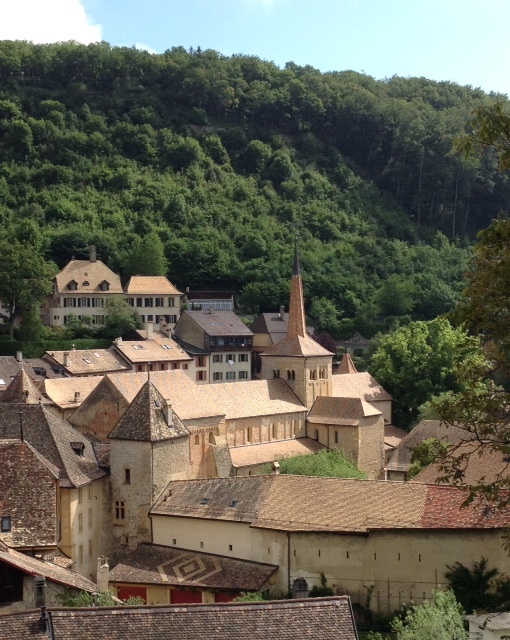 Then to the little town of St Maurice, where there has been an abbey almost since Christianity came there, and a place of worship even to the Romans. I was lodged with the Franciscans, and chanced on a convention of the entire Swiss Franciscan order. I assumed supper might be frugal. How wrong I was – local wine flowed free, local charcuterie, raclette, and pudding (though by then I was not in a state to remember what it was). I slept well in my little polished wood cell. The next day had a surprise in store – blue sky, hot sun; just a little tease to show what it could, what it should, be like. 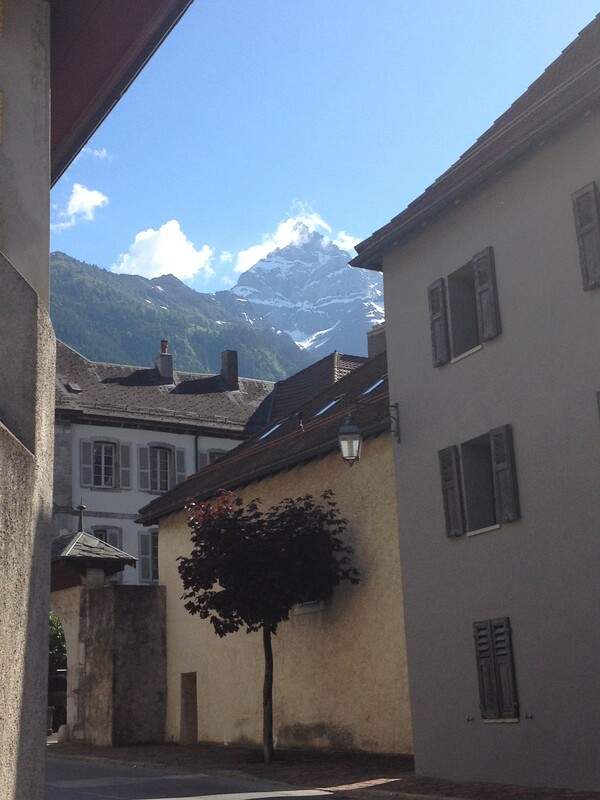 What joy, walking up the ever-narrowing valley, with sun glinting off the snowy peaks. Just a tease, though, for as I set off the next morning for the two most challenging days so far the deluge started once more, drenching and discouraging. Clouds clung to the mountains, the rain bounced from the ground such was its force, and I shouted ineffectually for it to go away. From Martigny there is a narrow path high above the valley, which the guides tell you not to take if it is wet, if you have no head for heights, and if you are not very agile. All those boxes ticked, I took a train a couple of stops to Orsières. 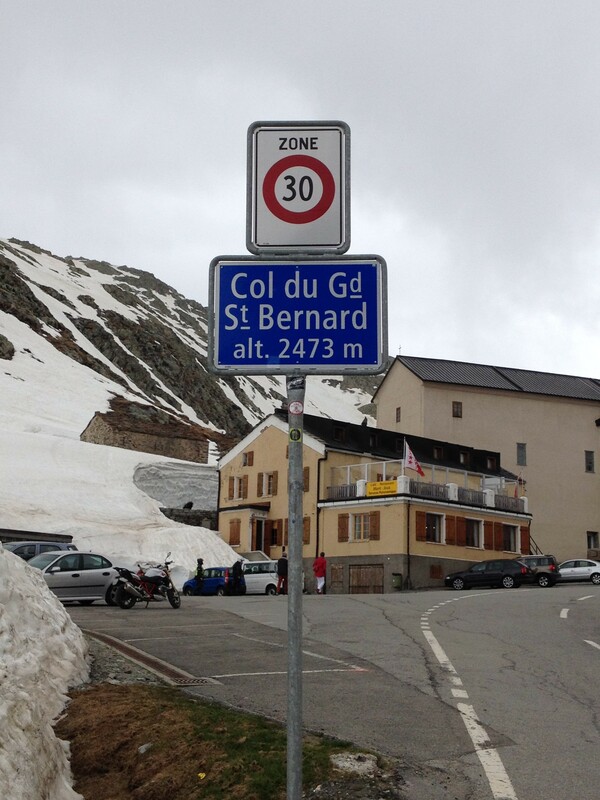 Here the climb up to the Great St Bernard pass really starts. The rain fell in cascades. 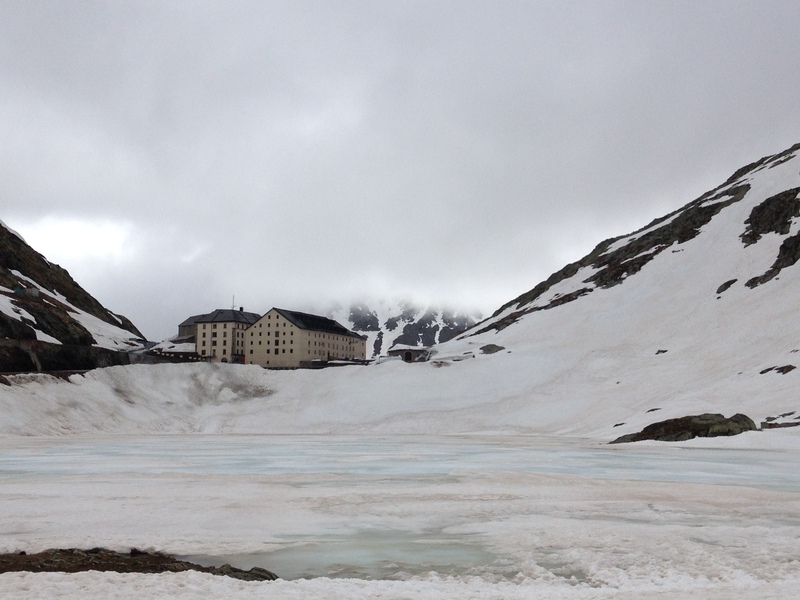 I should love to show you photos of alpine meadows with shining spring flowers, but it was just too darned wet. Dear reader, if you wear spectacles (as I must to minimise my chances of missing way marks) you will know that the heat of intense physical effort causes the glasses to steam up in the inside, and the raindrops similarly reduce visibility on the outside. I may be forgiven, perhaps, for the frequency of my getting lost. 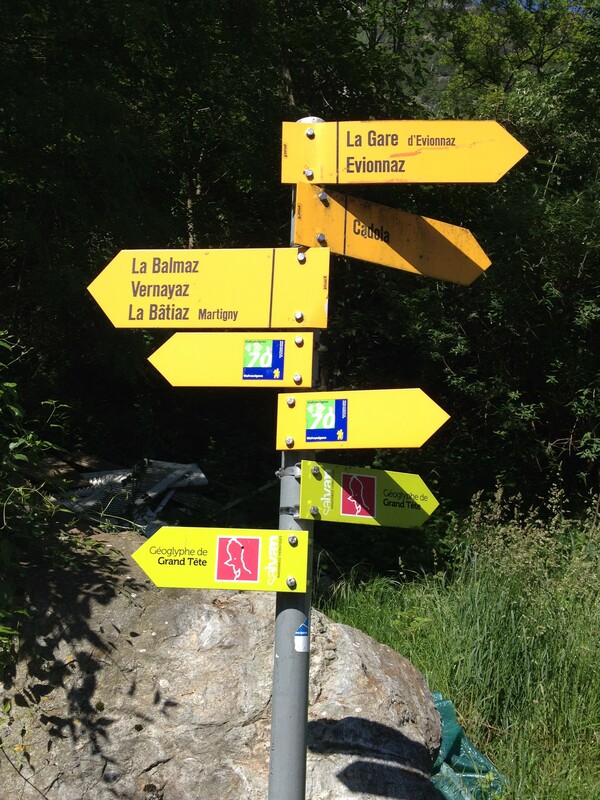 But Swiss signing is good, and I managed to get all the way up to Bourg St Pierre without much error. There it was chilly, very chilly, and I was glad that both my dormitory and the little church where I heard Mass were heated. And then the big challenge. Despite a poor weather forecast (nothing changes), the sky was clear and icy cold as I left Bourg St Pierre to climb to the Col, which is well above 8000 feet. 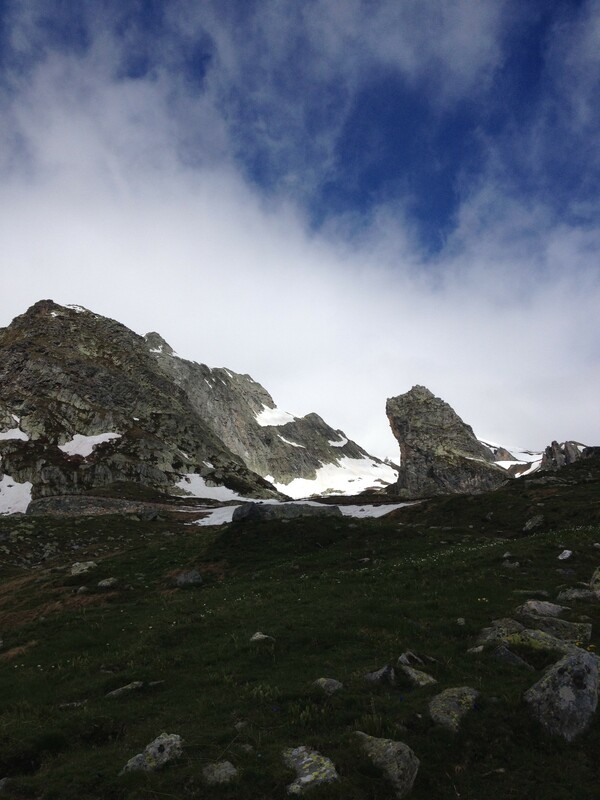 It was a magnificent climb: towering peaks, snow, alpine flowers, marmots, chamois, thundering cascades. But…taking off my pack to squeeze under an electric fence on the first part of the climb, I inadvertently dislodged the cap of my new water bladder. Disaster! Dare I refill from streams where there might be cattle pastures above? The guardian angel appeared with the answer- a herdsman mending a gate, who showed me where water flowed from the rock, and was safe. Up and up and up. By this time I was joyful and relieved to have a companion, a Québécois. Without the reassurance of his presence I doubt I’d have risked the passages over the soft deep snow, but on we went, only taking to the road for the last two km. what a relief to arrive, and see the hospice – as travellers for more than a millennium have felt, for in all that time it has never closed. We were welcomed by one of the monks with hot sweet tea. Once again, I fought my tears, for I had not imagined reaching this point, psychologically halfway, though geographically just past. We got there just in time: visibility reduced to zero, and it started to sleet. And so, steeply steeply down into Italy, where the sun shone. 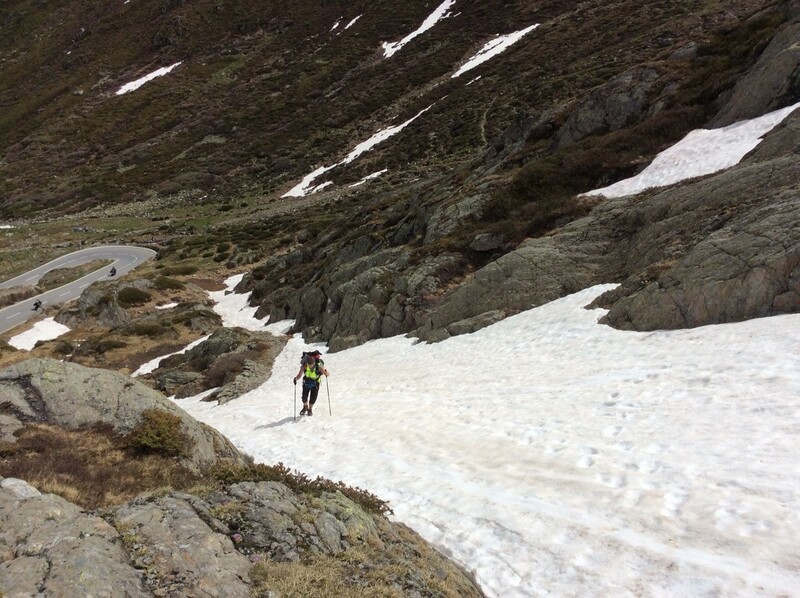 Steeply is not good for the knee, but it survived today with an epic doubling of distance through a wrong turning, this time not my fault (always blame others – a Swiss couple and the Québécois ). After six weeks in francophonie, I have forgotten every word of Italian (save for a few choice swear words), and feel utterly de-skilled and helpless. But the adventure goes on…. (If WordPress misbehaves again and publishes this unfinished or without pictures, please – those who receive this via email – look at the website where the full post will eventually be visible). and the Faculté des Lettres where I spent the summer of ’66. 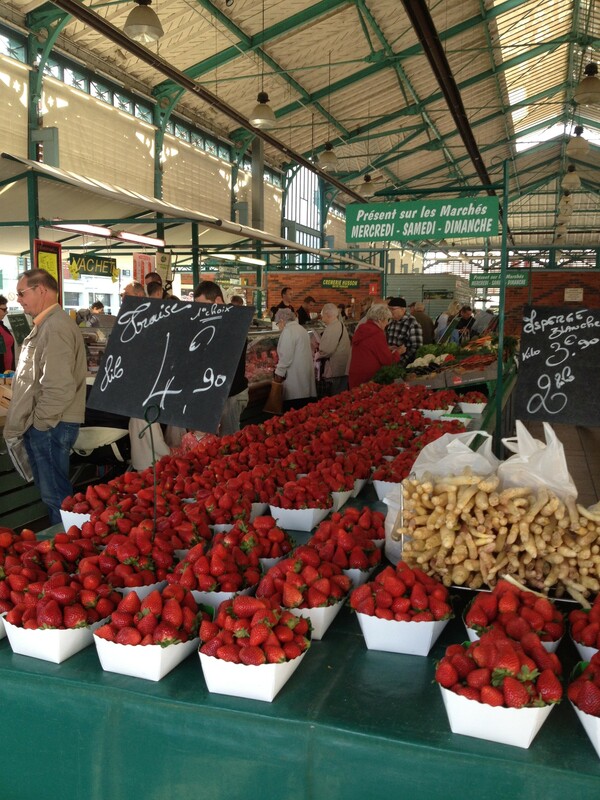 But days off are for practical concerns as well – a tram ride to Decathlon to get wax for my boots, so they might better withstand the deluges, and getting antihistamines and eye drops as – despite the wet – the hay fever season is upon me. 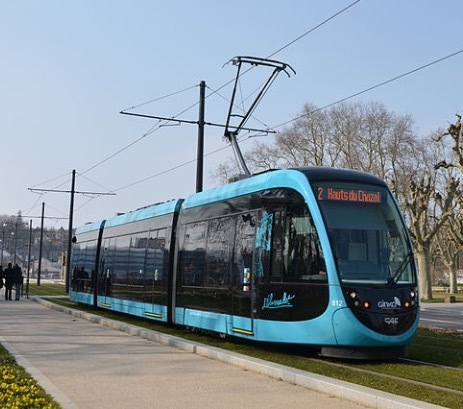 The Besançon trams are marvellous, as is the whole smart, joined-up transport system. 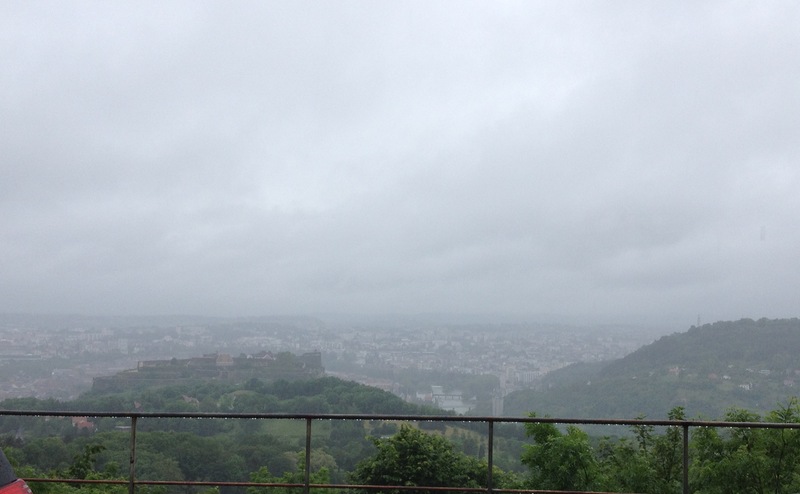 And then, and then, about the wettest day I have ever known as I climbed the steep kilometres out of Besançon. Water cascaded down the hills, the paths were once more deep mud. 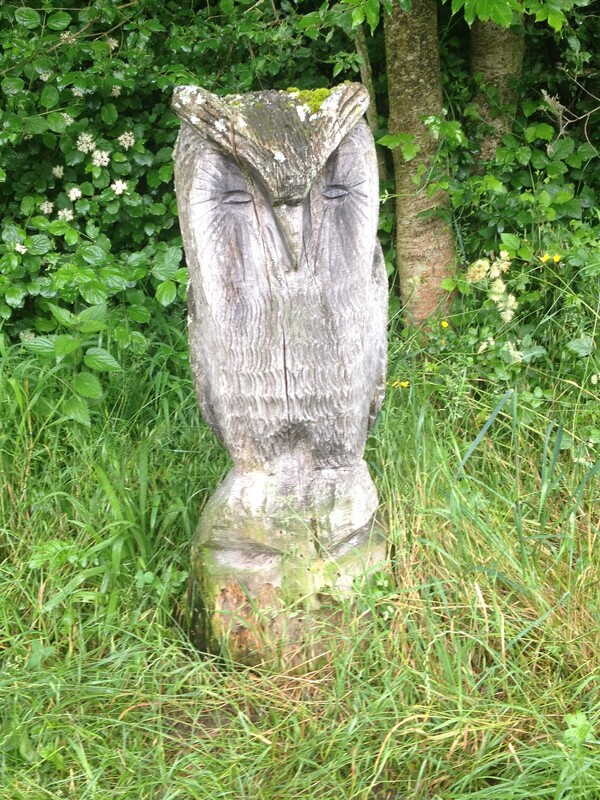 I emerged from a wood to find no signs, no way of identifying where I was. 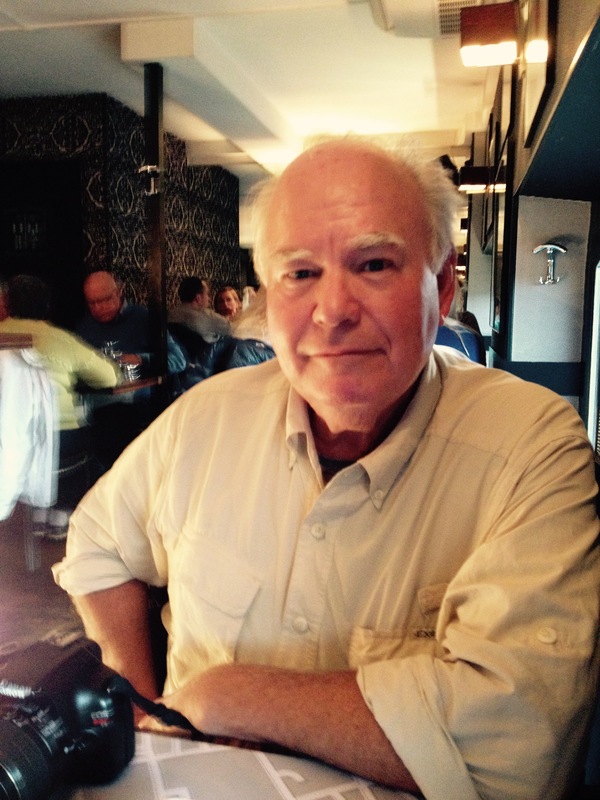 The guardian angel appeared on cue – an old man barrowing a bale of hay across the road. Is this the right way to the next village? No, it’s in the opposite direction. He saw my face, and said immediately he was getting his car out to take me. 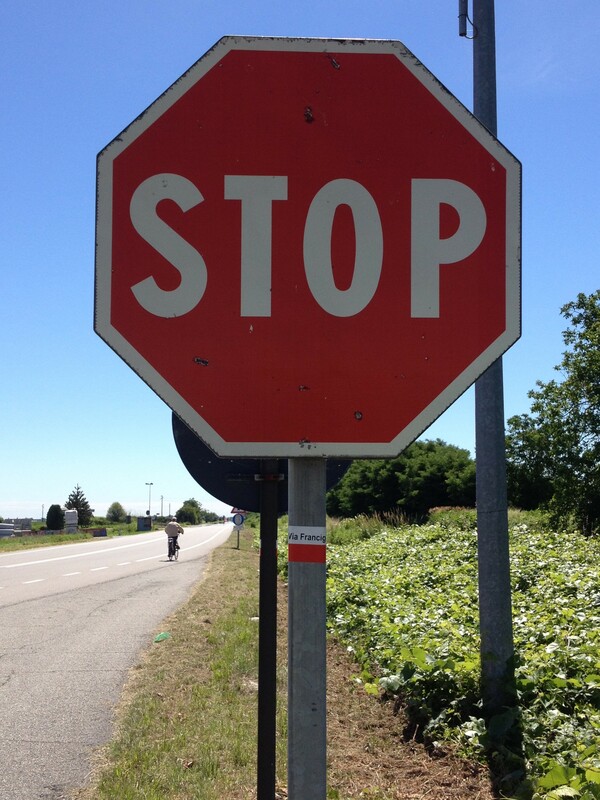 And he took me a further ten km, to a direct road to Ornans, embraced me and wished me good luck. add some whiter hair and some stubble and it could have been my angel of the morning. 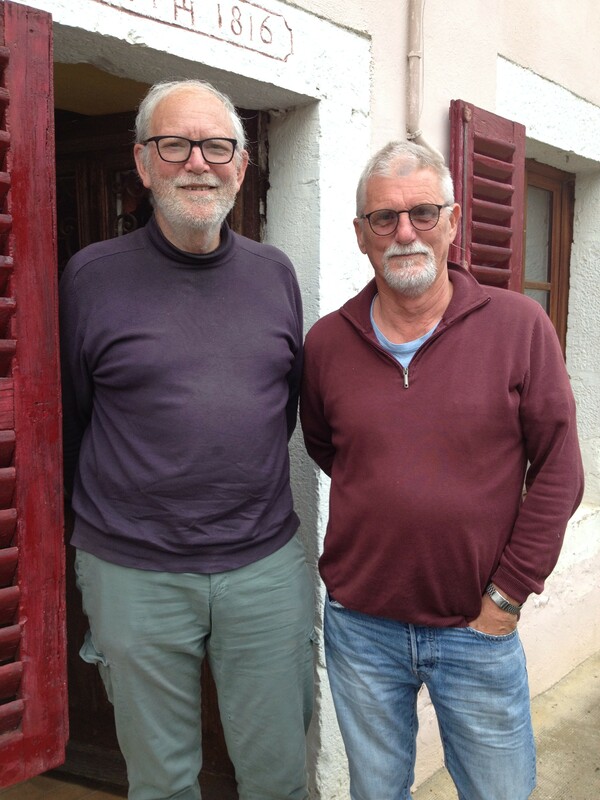 I was picked up from Ornans by Francis Geere, famous in the world of the Via Francigena. 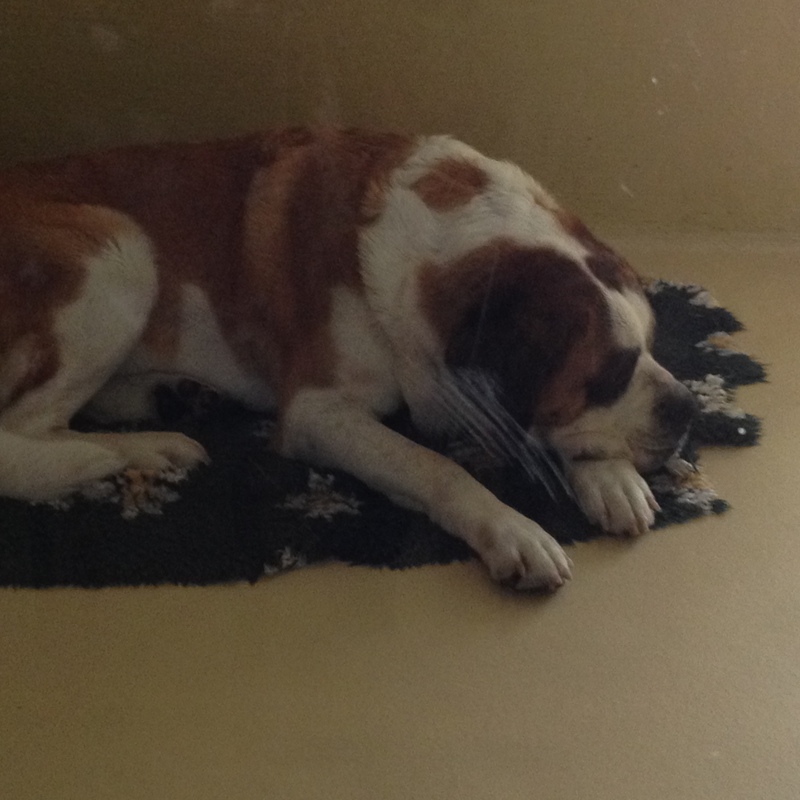 Francis looks after the route between north of Besançon and the Swiss border. He also accommodates pilgrims, picks them up from that day’s destination and drops them back the next morning. I stayed three nights with him, and thus could walk two days without carrying my heavy pack. Even packless I was unable to manage the tricky path up the Gorges de Nouailles where the river Loue springs from the rock and plunges down the narrow gorge. The constant rain (yes, it was still raining) turned the rocks into waterfalls so deep and powerful I knew my unreliable knee would not cope. One slip and…. one sees no one else on these paths. Prudence won (how unlike me), and I turned back. Next morning Francis showed me a path on the other side of the gorge which, although vertiginous (I didn’t look down) was less problematic. 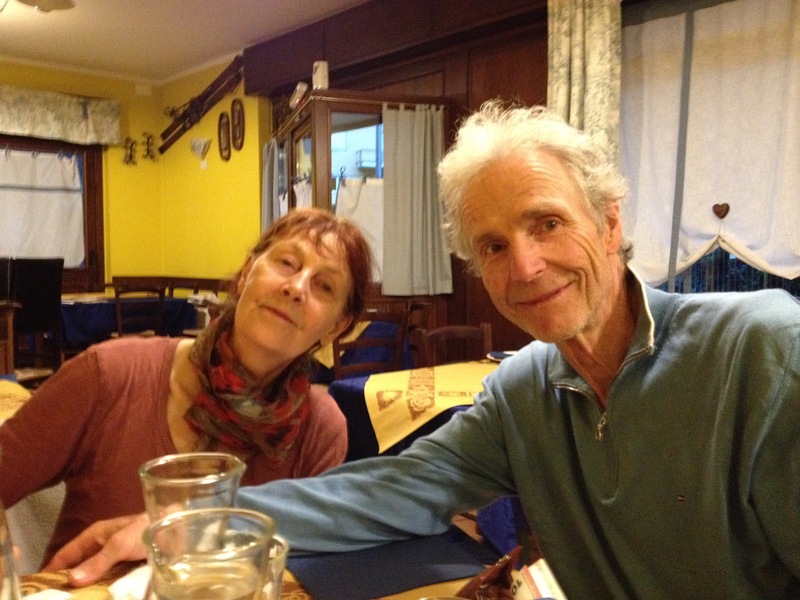 That night at Francis’s I met more VF “royalty” – Paul and Babette Chinn, the creators of the four volumes of LightFoot guides covering the route from Canterbury to Rome. The couple took two horses and a dog along the entire VF ten years ago, and have retraced and revised the path constantly since. 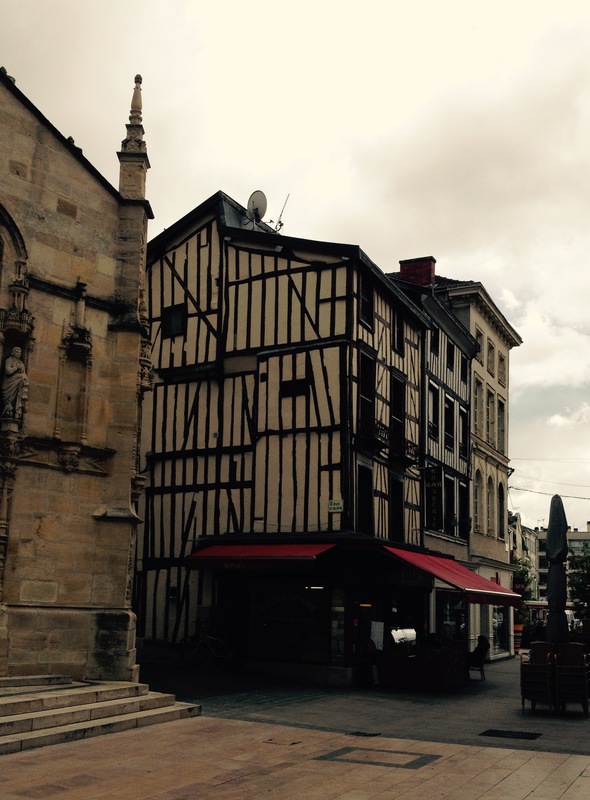 So to Pontarlier (famous for the distilling of absinthe) and on towards the Swiss border. It was still raining. 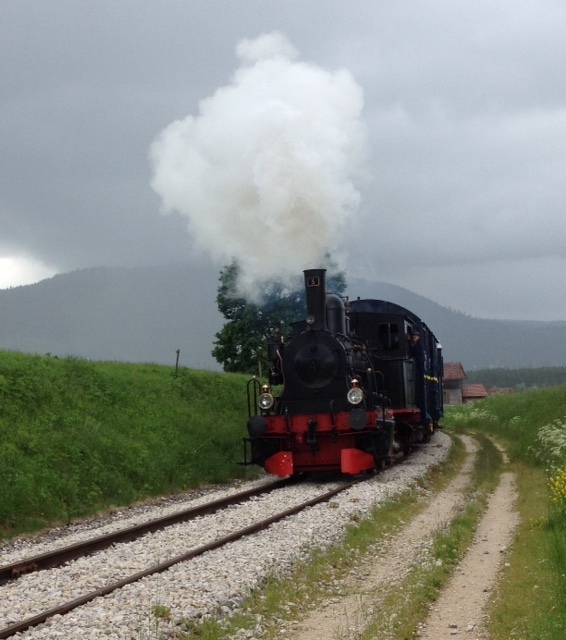 I plodded alongside a little tourist train track, feet bruised by stones. Along came a little steam train with two blue and gold-liveried restaurant coaches full of French at their Sunday lunchtime trough. I felt unkindly resentful as they cheerfully waved at the drenched and forlorn figure by the track. In order to find accommodation for that night I had been obliged to walk far further into Switzerland than I had wanted. Just before the border the rain became a diluvian torrent. Soaked to the skin I found the porch of a house with a chair in it, and there, dear reader, I sat down and wept for the second time on this pilgrimage. I wept from self-pity, from the dispiriting downpours, from the pain referred from my knee up my thigh into my haunch and back. I shouted at the rain, “I want a miracle!”. There was no blinding flash of light, so I plodded on, crossing the border on a small path. Swiss rain is very much like French rain, and but accompanied by the constant tintinnabulation of cowbells. That visit added to my sense of blessing, of benediction. 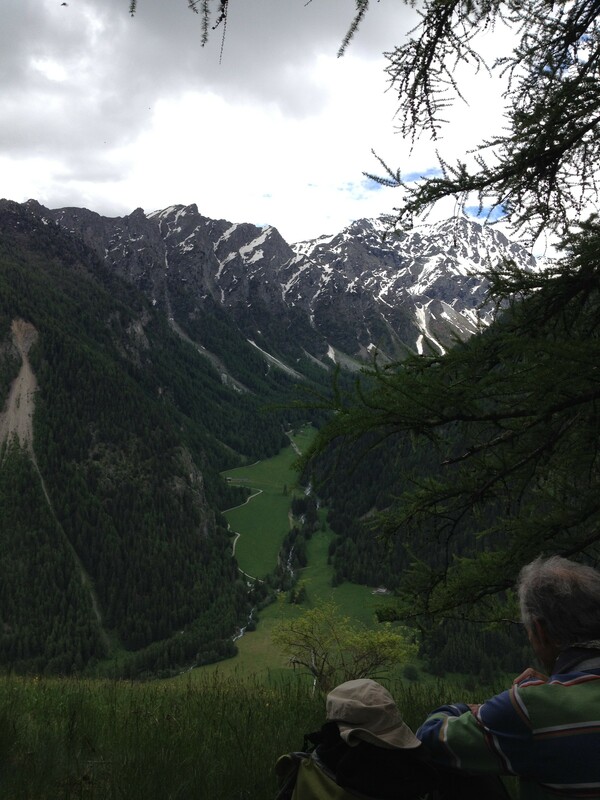 As we arrived someone was playing an alphorn the other side of the valley. In the church I felt utter peace and restoration. After the church we drank tea in the prior’s house. There was more blessing and healing to come. Philippe said “I cannot let you go in pain like this”. For what I have not told you is that he is a chiropractor and masseur. He took me back home and worked with hot oil on my aches. “It will come back,” he said, “But it will get you a few days further “. And life changed colour. On cue, the sun came out. With enormous gratitude in my heart I walked on southwards along another beautiful gorge, the path dappled by warm sunlight. Swiss paths are beautifully way marked. And so on down to Lausanne, where I am now. The snowy Alps are visible across Lake Geneva (Léman), reminding me of the challenge to come over the next week. And there is cloud and the threat of thunderstorms for the next few days. 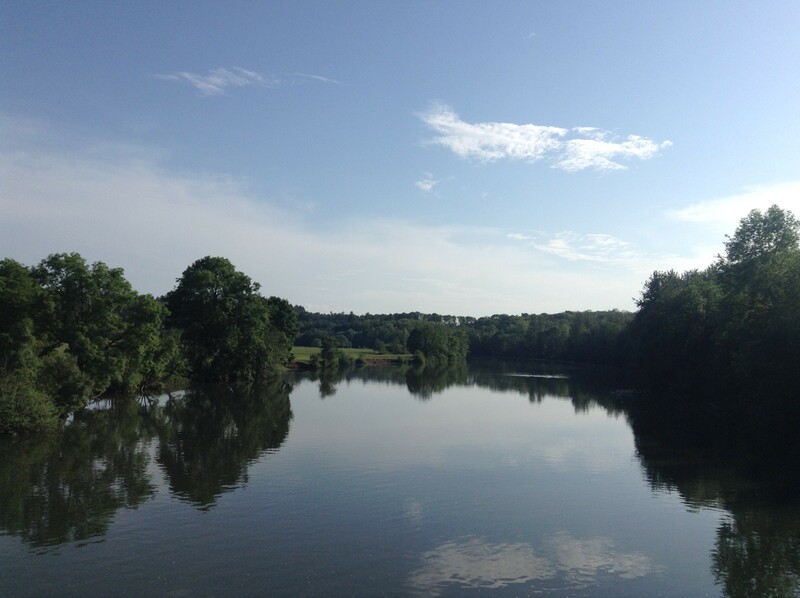 Tomorrow I emulate Archbishop Sigeric and will take the boat to Villeneuve on the other side of the lake. The way goes on, through grace and the kindness of many. Maybe the next post will be from Italy, DV. 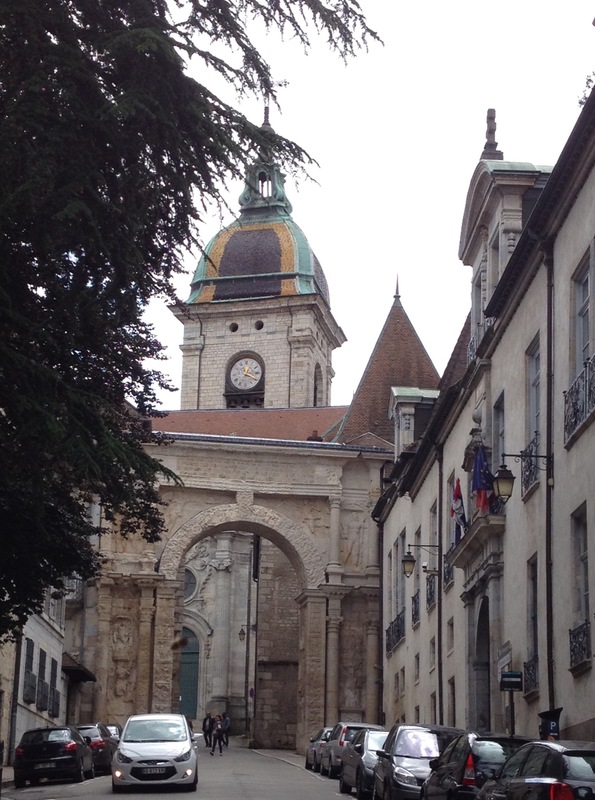 Monday 30 May: at last, Besançon, where 50 (yes, 50) years ago I spent the summer doing a course at the university. The city seems to have spread enormously since then, and I walked through the vast commercial outskirts in wind and rain. But a combination of his ministrations, much prayer and many good wishes have worked the miracle, and I have walked on with not too much discomfort for more than a week now. So Saturday 21 May saw me whizz over the 100km that I needed to make up in a little under two hours (including a change of train). Those who like me travel on the Norwich to London line will find the idea of a punctual, clean, and uncrowded train something of a novelty. 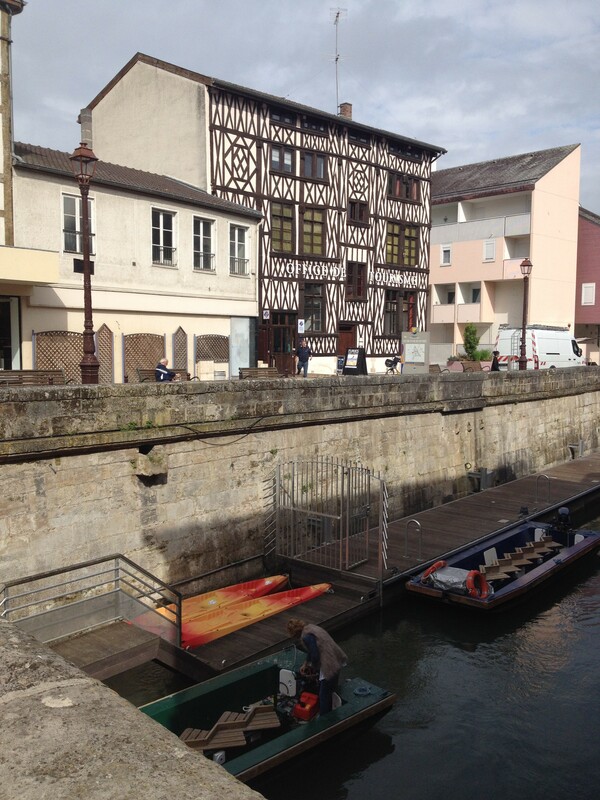 The train took me to the pretty town of Bar sur Aube, with its half-timbered houses. I stayed with Josette Bonnevie, who welcomes pilgrims to her house, and who fed me the healthiest meal so far. Alas, she said, “Je m’appelle Bonnevie, mais ma vie n’est pas bonne”. She was recently widowed, and we talked of how difficult Sundays are when you live alone – and everyone else seems to be with family. That Sunday my first day’s walk was a short stage in pouring rain along muddy rutted forest tracks to Clairvaux, where St Bernard founded his abbey in 1115. I had imagined a pretty valley with graceful remains of the 12th-century abbey buildings (think Rievaulx), even though I knew the abbey was now a high-security prison. I decided to take the tour that afternoon. It was a dismal prospect in the pitiless rain. Having surrendered my passport (security), I and about 20 others were escorted round the dilapidated 18th-century (nothing remains of the 12th-century) edifices, with crumbling masonry and broken windows. It was cold. It was uninviting. It was grim. The guide was an expert on all things Cistercian, and a 75-minute tour doubled in length. As his enthusiasm mounted my blood sugar level descended. I wasn’t quite sure I’d survive the Cistercian word avalanche. Back to the two lovely old nuns who offer hospitality to pilgrims and to those visiting prisoners. They soon brought my blood sugar level up with an enormous supper, and opened a bottle of Bordeaux just for me. 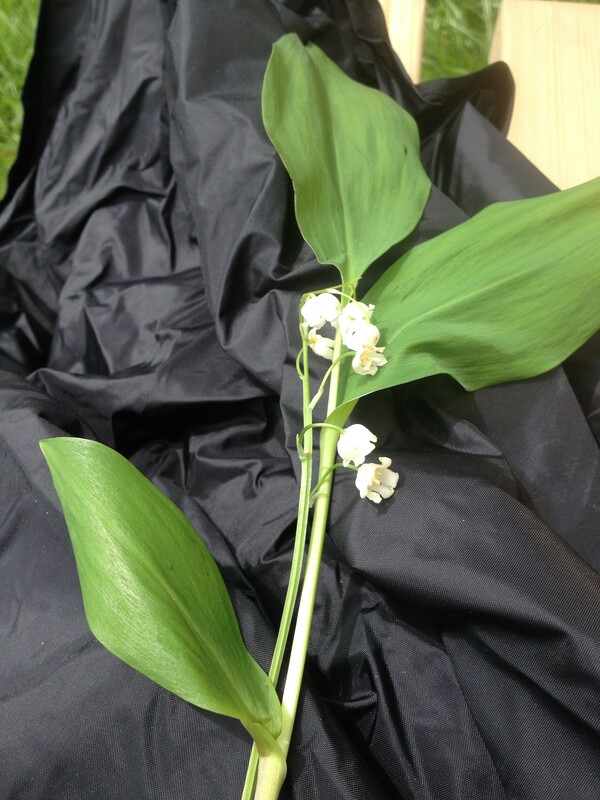 Next morning Soeur Pierrette, who had spent her life in Africa in leprosy missions, gave me a sprig of lily of the valley. “By the time this fades,” she said, “You’ll already be far away.” I cried again. 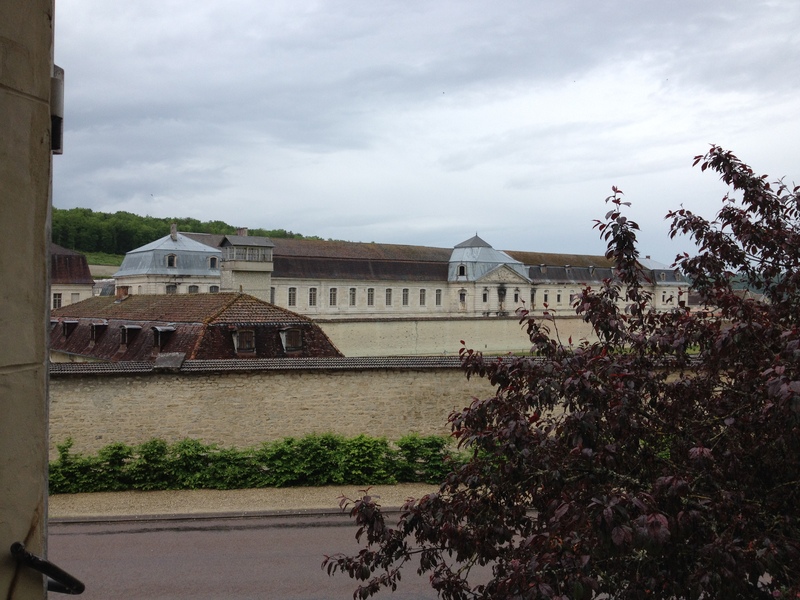 The region round Clairvaux is rapidly becoming an employment desert: industries and shops are closing, villages are dying, and the threatened closure of the prison will remove 250 local jobs. All through the following week I walked through dead villages and towns, where shops and businesses are for sale. I did indeed feel a “pilgrim in this barren land”. The next day the rain forecast for mid morning held off till I arrived at Châteauvillain. As I walked, the cold wind riffling through the fields of barley made them look like newly unplaited hair. One of my favourite smells is the incense of young barley after rain. Châteauvillain would have been worth a good look, with its towers, fortifications, narrow alleys, and its ancient lavoir, but the sky turned black and the rain streamed through the streets. I stayed with an English couple who run a bar, restaurant and B and B. The cooking was good, but I was the sole occupant. These towns are suffering, possibly terminally. Oh the interminable dripping forests of the next day! Dark, forbidding, evoking atavistic fears…on and on they stretched, the imagination giving rise to all sorts of evils. I lost my way, of course. If a guidebook says “Fork left on the third grassy track after the T-junction of tracks” there is some room for error. With error comes terror. Not a soul does one see, the only living beings the magnificently-antlered stags which occasionally cross one’s path. But…the guardian angel appeared on cue: a forester with two dogs, who accompanied me the kilometer or so back to where I should have been. And no-one else did I see all day. After that a veritable crowd of pilgrims in one evening – two! 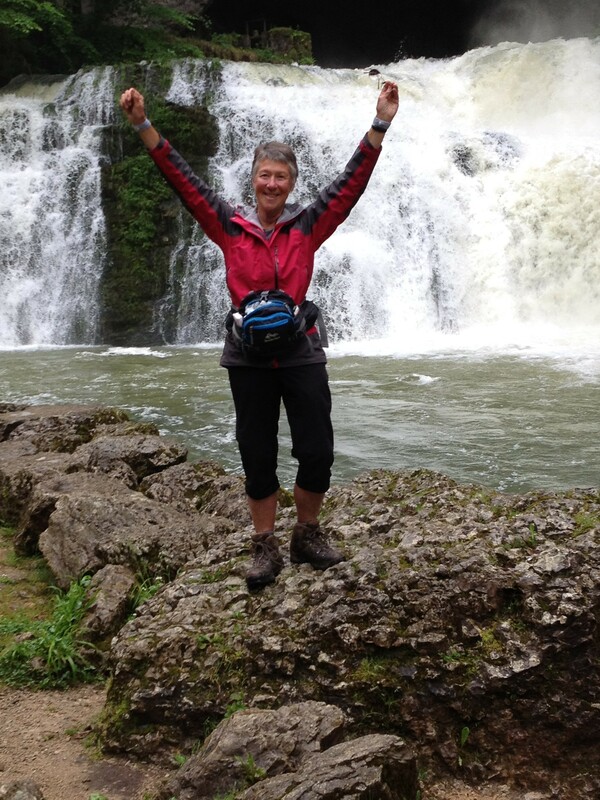 Edith a Parisienne of 73, going to Lausanne, and Edward (74) a taciturn and monoglot Scot on his third Via Francigena. At 69 I am a mere babe. On to Langres, perched high on its hill, with a monumental and icy cold cathedral. 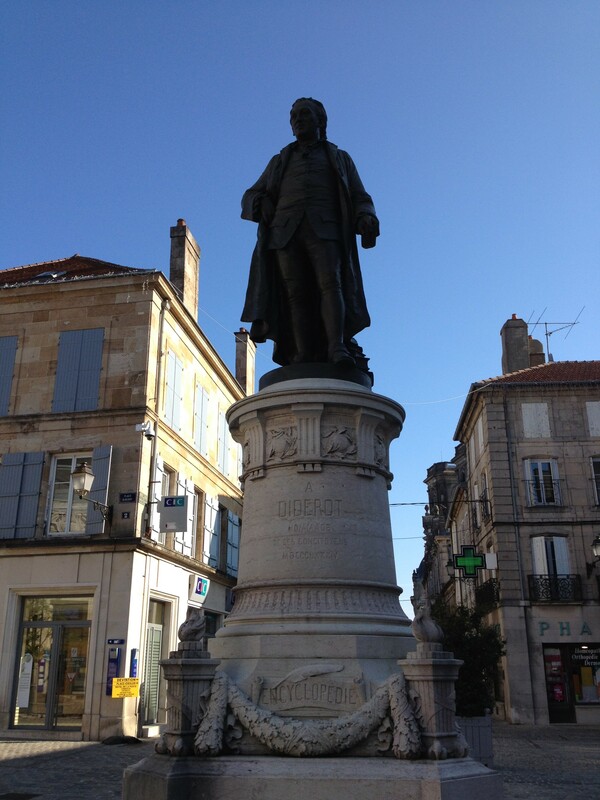 Langres is the birthplace of Diderot, the great figure of the French Enlightenment. Here I stayed in the presbytery, in a little flat for pilgrims with a shower and basic cooking facilities. By now the weather had turned very hot (there seems to be no in between). As I sat the next day in the shade of a church eating my crust a lady going to the cemetery asked me in for fruit juice and coffee. We talked at length about the economic depression of this area – and of the difficulties of widowhood, a theme which seems common to many of my exchanges. the weather became even hotter and more humid, with the promise of storms. I asked some people sitting eating a leisurely lunch outside their house for some water. I was made to sit down until I was cooler, given coffee as well. People seem surprised that anyone should think of going to Rome on foot, yet so many do. Again, the kindness gives me heart. 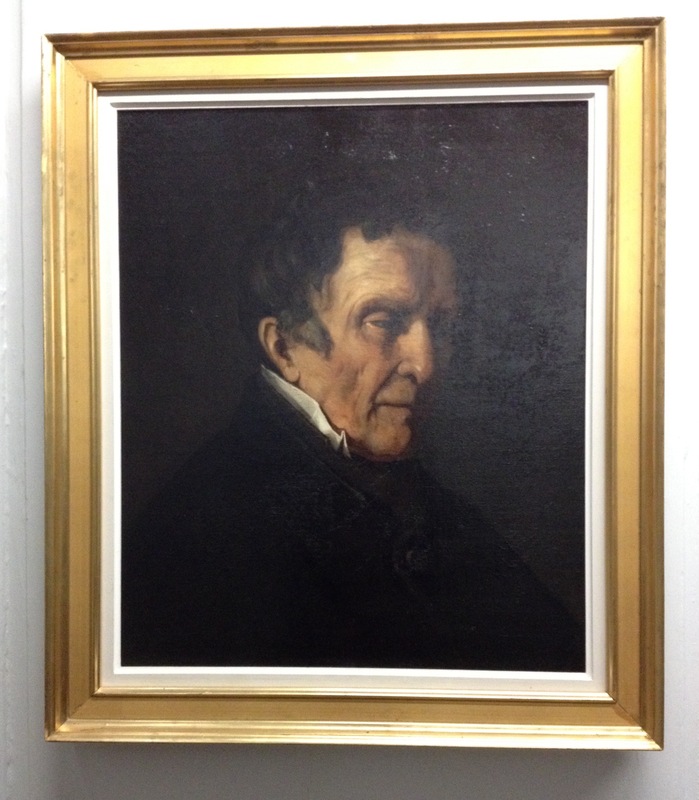 That night I was lodged in a building belonging to a vigneron, in fact in the kitchen used by his two student workers. The shower was over the road in a garage – note to self: take clothes with you next time. There was a storm that night. The next day humidity and temperature rose higher. 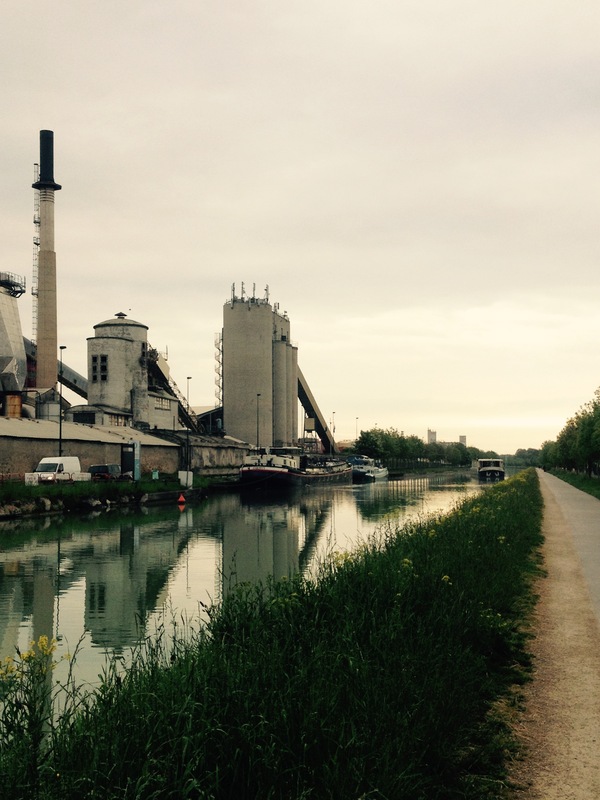 I walked along the banks of the broad and tranquil Saône to my lodging. This was the only time in all my walks that I felt it prudent to put a chair against my door. Why? 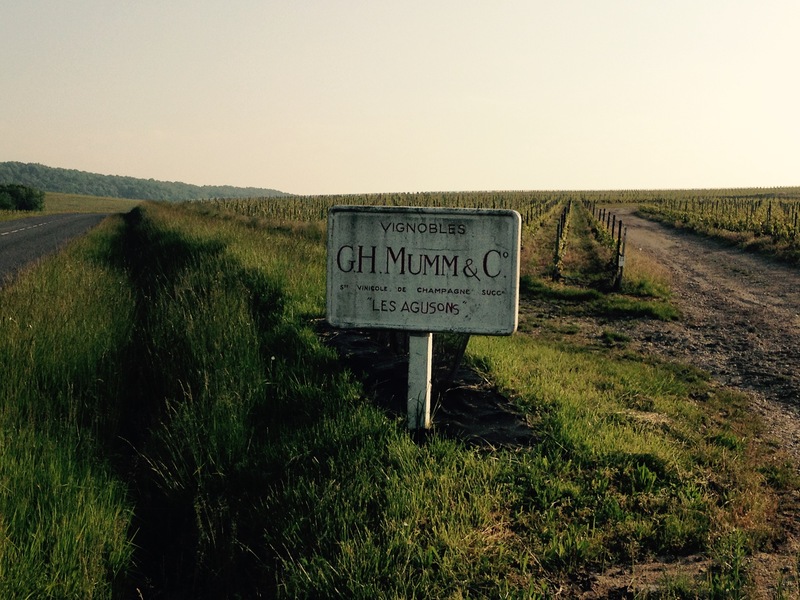 Just a feeling that the owner of the gîte was slightly….weird. There was thunder and rain, and the weather broke. And so, by easy stages via Gy and Cussey sur l’Ognon to Besançon, where I shall take it easy before the vertical challenges of the Jura and the Alps. Here the rain falls in torrents from a black sky, its swathes obscuring the surrounding mountains. There are other pilgrims around: Chris Jackson from Derbyshire crippled temporarily by blisters; Geoff Collier from Connecticut. Paths cross, briefly intertwine, separate again. Who knows what will become of us, where we shall get to. I am aware of the tremendous support I am receiving from everyone. So far so good with the knee, and one day at a time. The next post will, as usual, depend on the availability of wifi. From where I cannot say. Because I try to stay in pilgrim accommodation where possible I don’t have the luxury of wifi, and although I have mobile data on this iPad connectivity in this deeply rural part of France is aleatory. So I haven’t been able to post. But for those who are concerned, I am not lying dead – or even drunk – in a ditch, and my knee is better than it was. 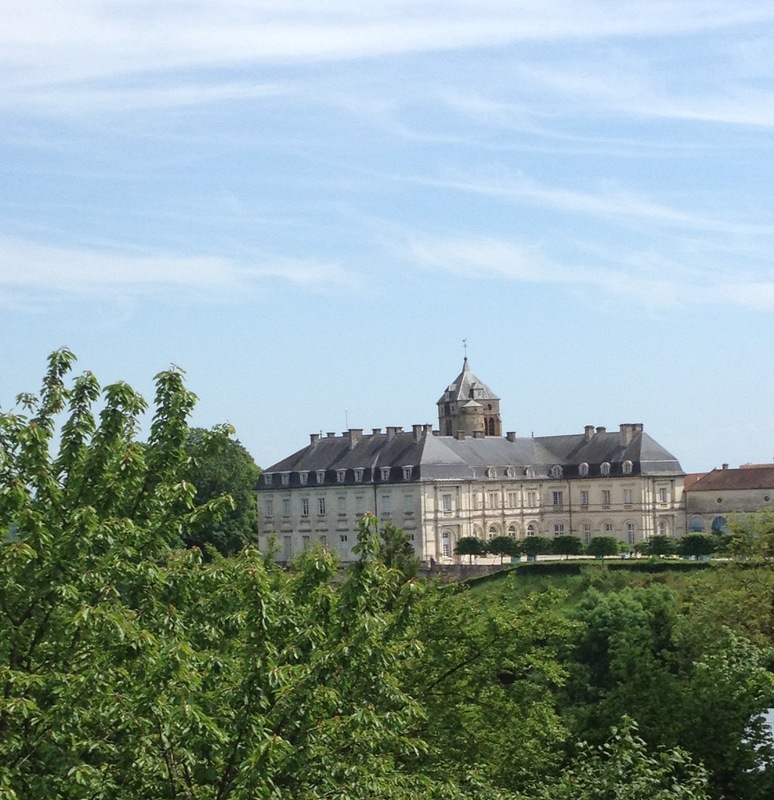 I should be in Besançon on Tuesday (May 31), where I’ll take a day off, and post about my journey from Châlons. To those who prayed, encouraged and helped, many thanks. I have ceased visualising taking the Alps in my stride, and triumphantly entering Rome; I am just concentrating on getting to the end of each day. 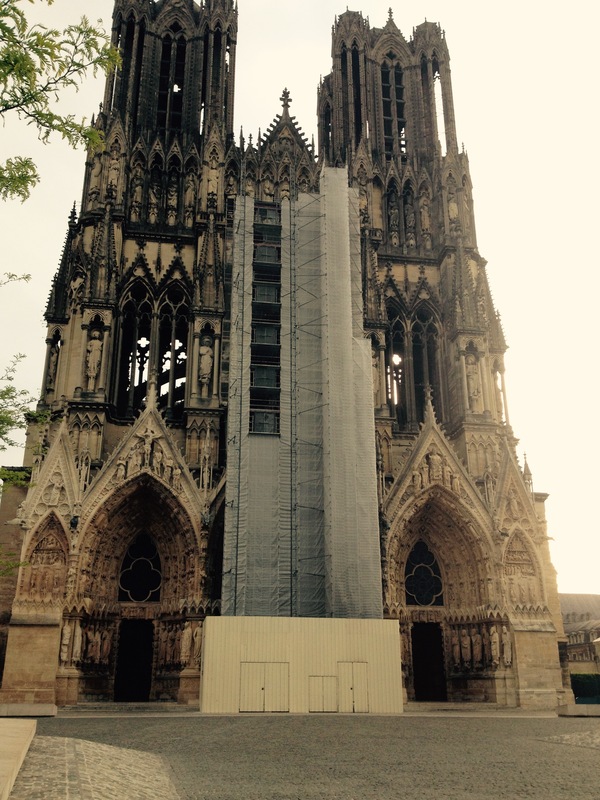 I was pleased to leave Reims. It was cold, large, grey and inhospitable. It’s hard not to judge a place by how one is treated, and – arriving with my boots, stick and rucksack at midday – I was turned away with sneers by two waiters in a so-called “pub” where I had sought a bite to eat. High Mass at the Cathedral was impressive, but longer (much longer) than any church service should ever be. It being Pentecost there were confirmations and at least 50 candidates. Even with two auxiliary bishops going flat out (the archbishop was in Shanghai) it took forever. I was disgruntled, and so did not feel able to go through the Reims Door of Mercy. The pilgrim leaves Reims along the Canal Latérale à la Marne. Towpath walking is good: flat and smooth. 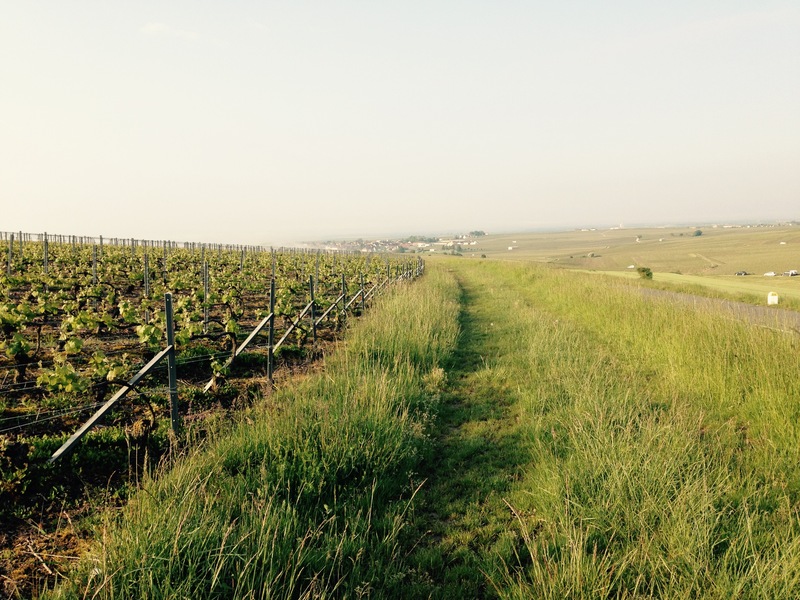 But all too soon I was back on road, with champagne vines stretching as far and further than the eye can see. It was a public holiday, and past me in the road whizzed expensive cars from Germany, Belgium, France and GB doing a champagne tour. My lodging for the night was with an elderly lady who in her time has welcomed more than 500 pilgrims. She knew what was needed: hot shower, plenty of food, and an early start in the morning. The next day there was delightful walking along the towpath again, with the usual counterpoint of nightingales and cuckoos. Despite this, the frequent road walking carrying a heavy pack (much water must be carried) had taken its toll on my bad knee (injured nine years ago, but on which I fell heavily the week before departure). 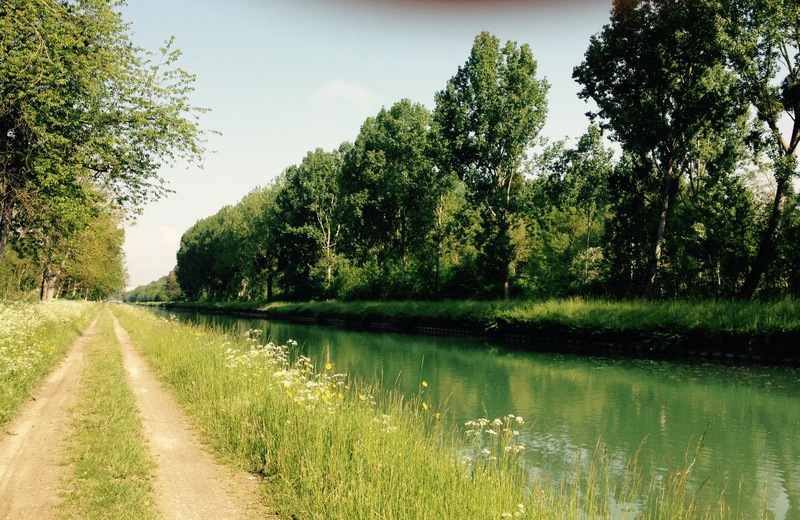 I hobbled into Châlons, which is on the Via Agrippa, the Roman highway from Milan to Boulogne. 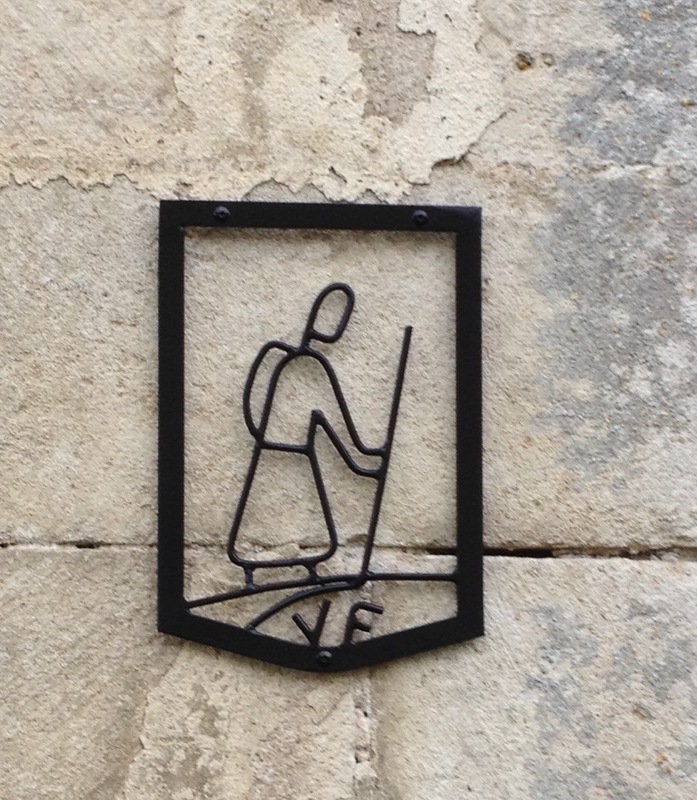 I obtained the stamp in my pilgrim passport from the church of Notre Dame en Vaux, one of the crossing points of the Way of St James and the Via Francigena. It proclaims the largest set of bells in Europe. Were it not for the fact that the CGT (Confédération Générale du Travail) is on strike yesterday and today (18/19 May), and thus trains not running, I might have been back in England by now, with my tail between my legs. The pain in my knee (injured years ago, and never pain-free) became almost unendurable, and my fear was of doing more and permanent damage. 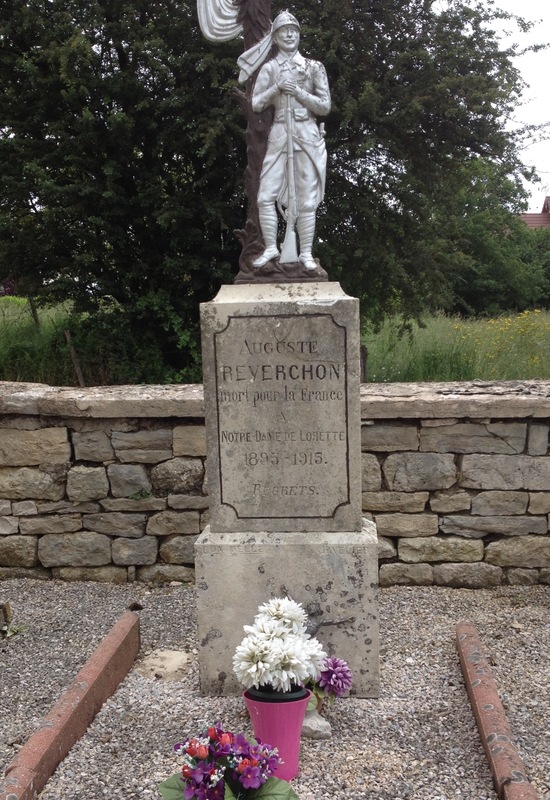 Five kilometres on from Châlons en Champagne early yesterday morning I sat down and wept. I wept from pain, but more from the utter defeat and humiliation (after so much trumpeting and publicity) of having to give up. Those who know me will understand I don’t do failure. Was the purpose of this pilgrimage to teach me humility? But I think the guardian angels are at work. 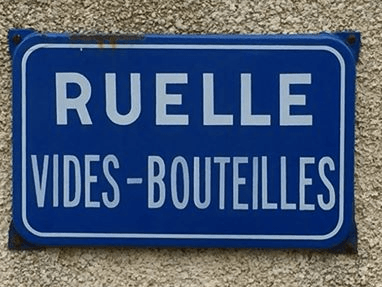 I hobbled back to Châlons, asked a kind pharmacist if he could tell me the name of a doctor close by (I think I wanted medical authority to stop). He got on the phone, got me an appointment at midday. A charming and sweet young doctor (she looked about 18) examined the whole leg carefully and pronounced it not to be my old torn ligament but acute arthritis (bone on bone) brought on by all the hammering along roads built on steep cambers. She said what a specialist said back in 2009 – that I need a new knee. She said “Sometimes it takes more courage to stop than go on. But I am going to give you the best chance I can of carrying on.” She prescribed strong painkillers, anti-inflammatories, three sessions of physio, a knee brace, and complete rest for three or four days. She didn’t charge me anything (I cried at the kindness again), but mainly I think because nobody in the surgery knew how the EHIC works. So here I am, using my emergency money, in an hotel in Châlons. The physio (who looked like David Tennant, and who was as kindly and charming as everyone else I’ve met here) fitted me in that afternoon, and I’ve already had two of my three sessions. Could this, would this ever happen in the UK? A doctor’s appointment and physio the same day? And so, God willing, on Saturday I shall take a train to Bar sur Aube, which is where I would have been. I need to keep to schedule because money and travel insurance are not infinitely extendable. Of course I feel guilty about using public transport, but anyone who has done a long-distance pilgrimage on foot will tell you this happens. Some take trains and buses even when not injured. The medieval pilgrim would have jumped onto a passing oxcart. And so I hope to get to Besançon by easy stages on foot, where I will review the situation before the long upwards pull into the Jura and the Alps. From those who have faith I ask renewed prayers; from those who do not – please send me positive healing thoughts. I didn’t realise, when laying out my last post (Arras to Reims) that placing the photos in “galleries” would make them invisible to those who read the blog via email. I shan’t do that again. Please have a look at the original website http://quovadis-walkingtorome.uk to see all the pictures of this latest stage of the journey.